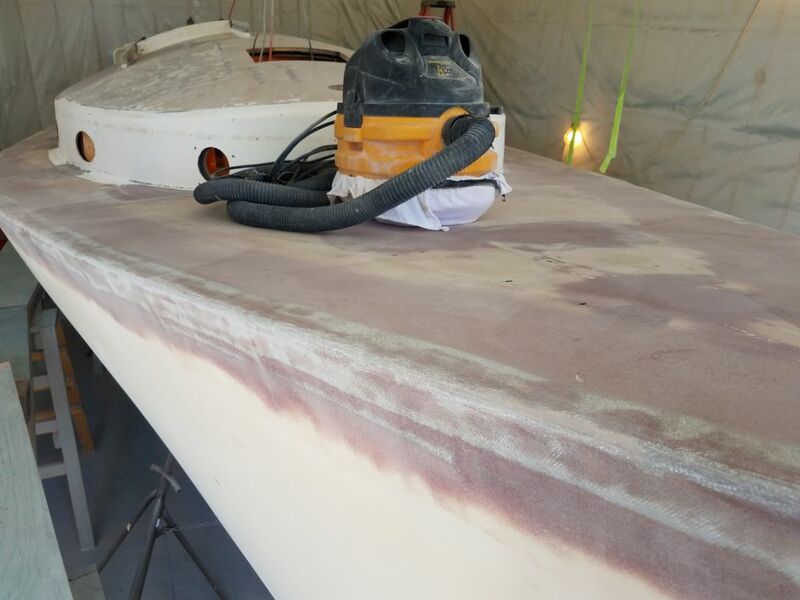 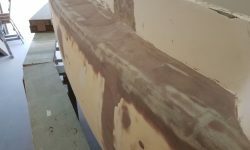 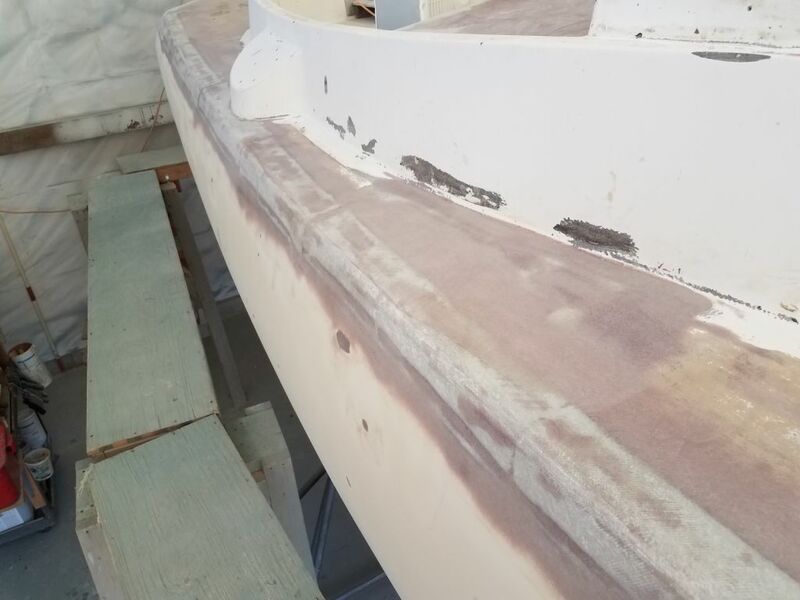 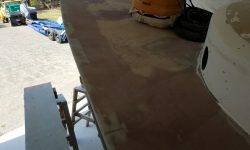 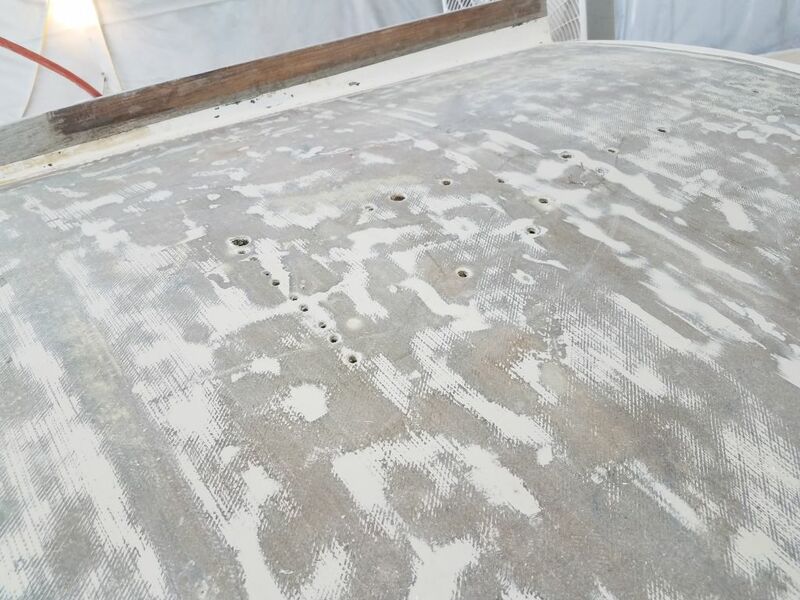 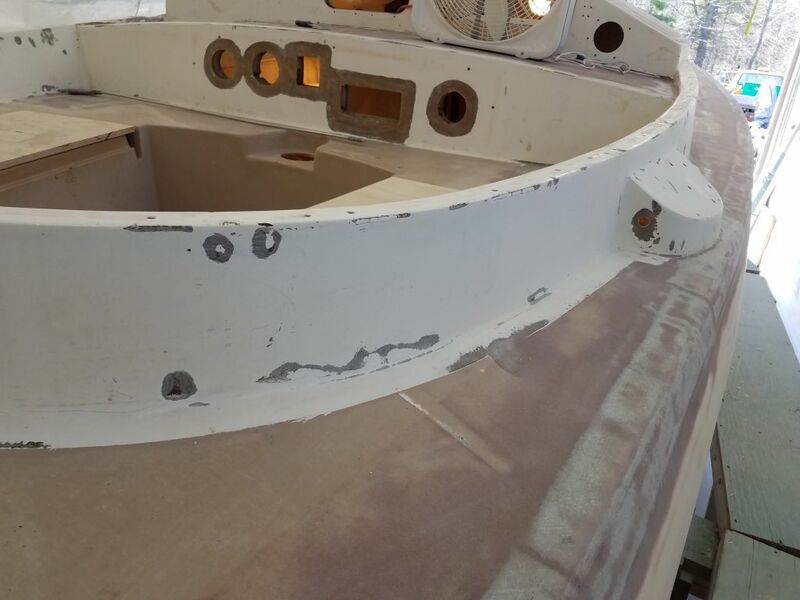 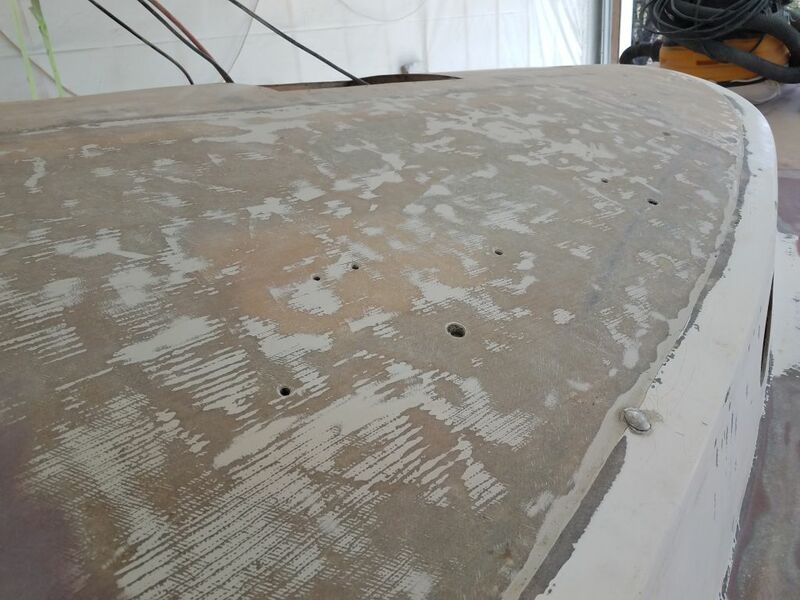 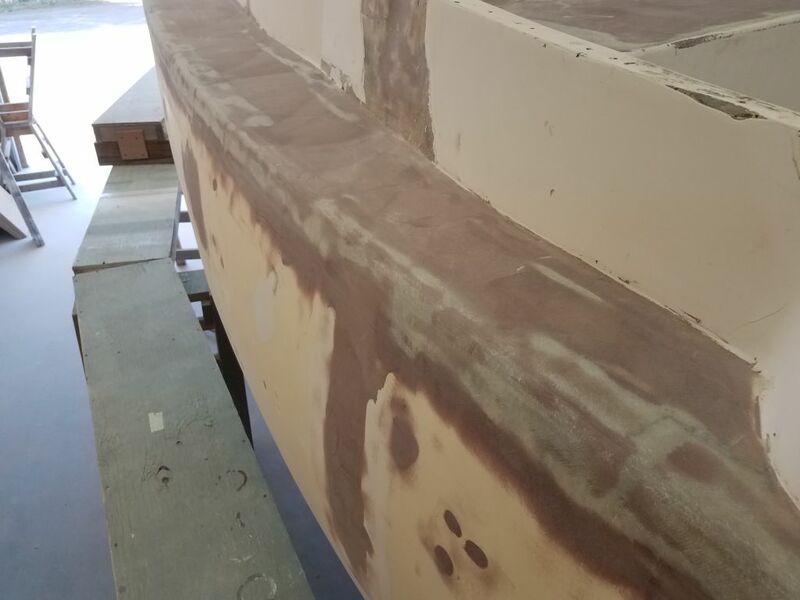 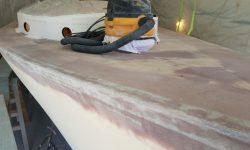 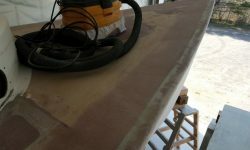 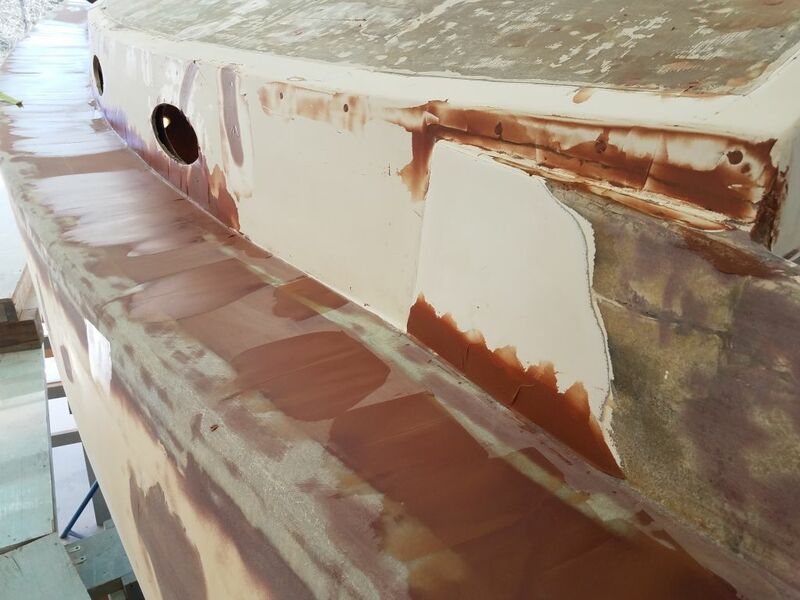 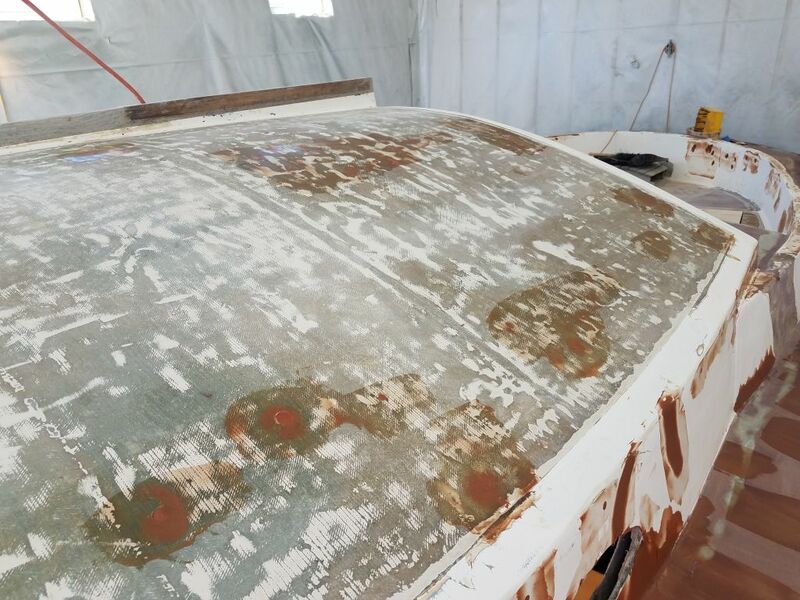 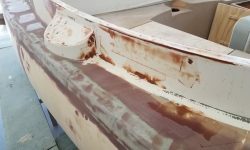 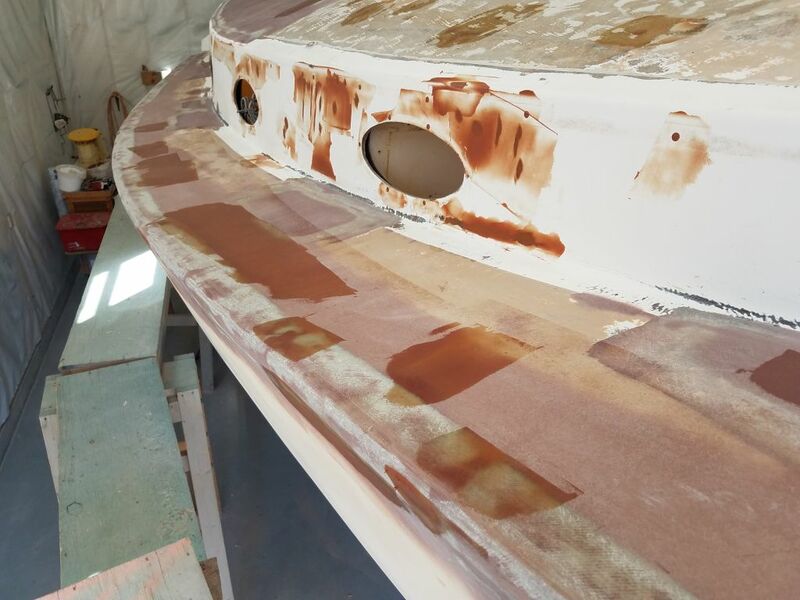 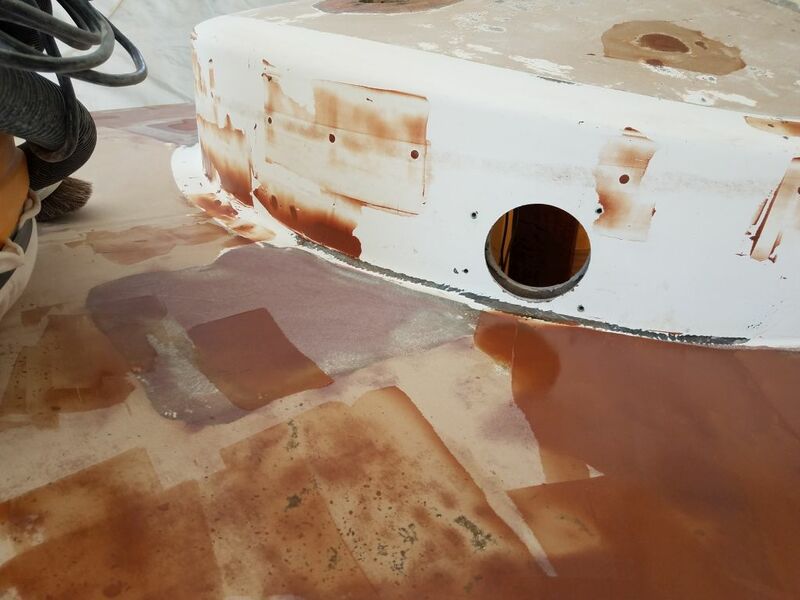 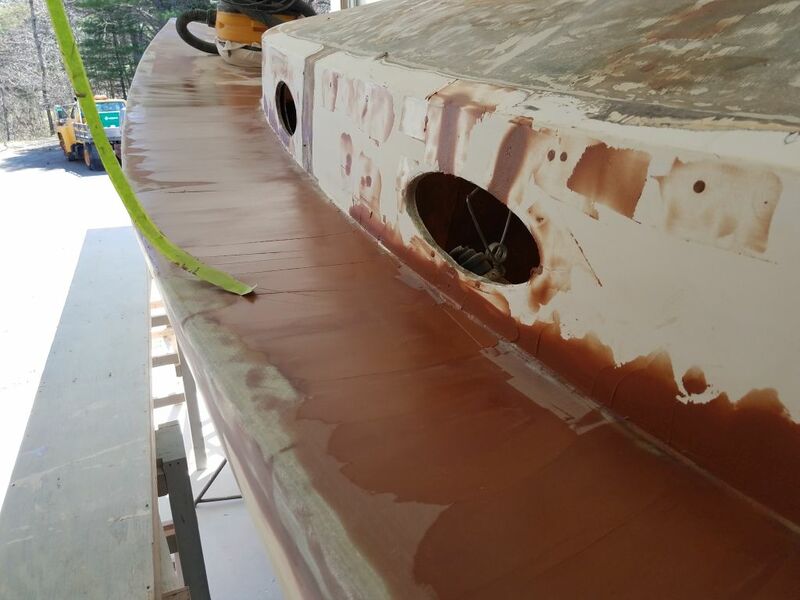 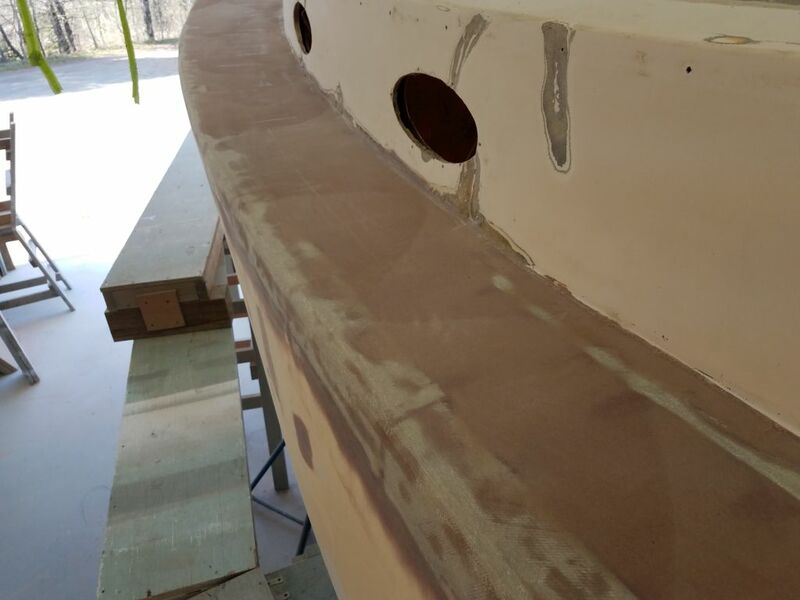 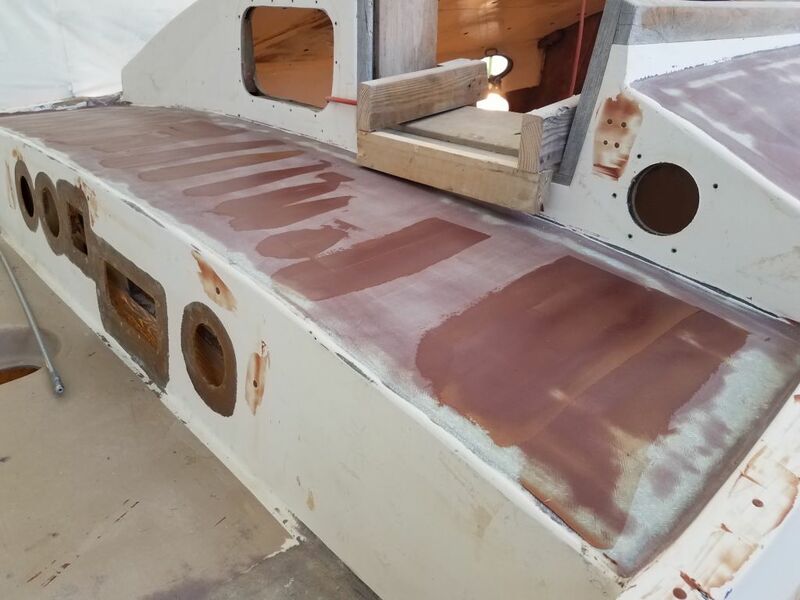 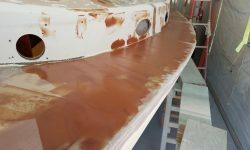 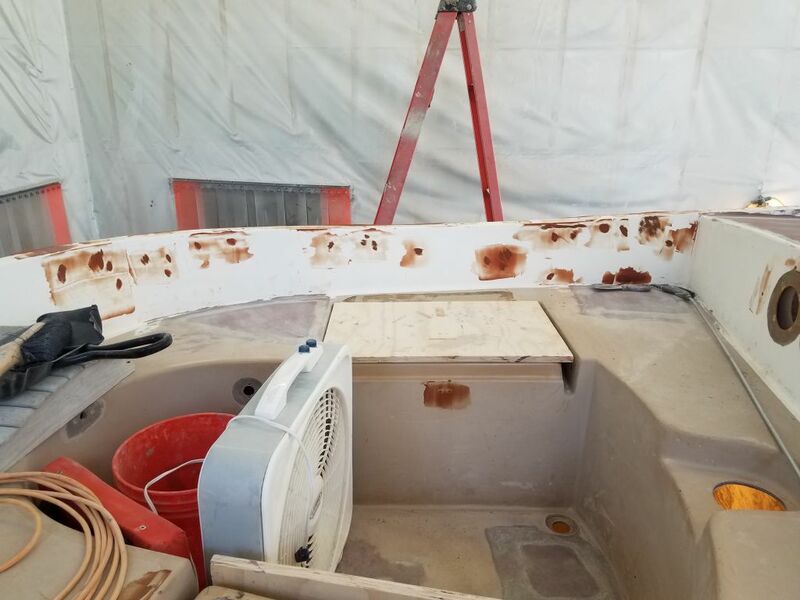 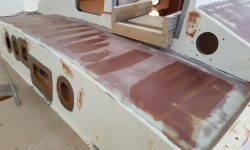 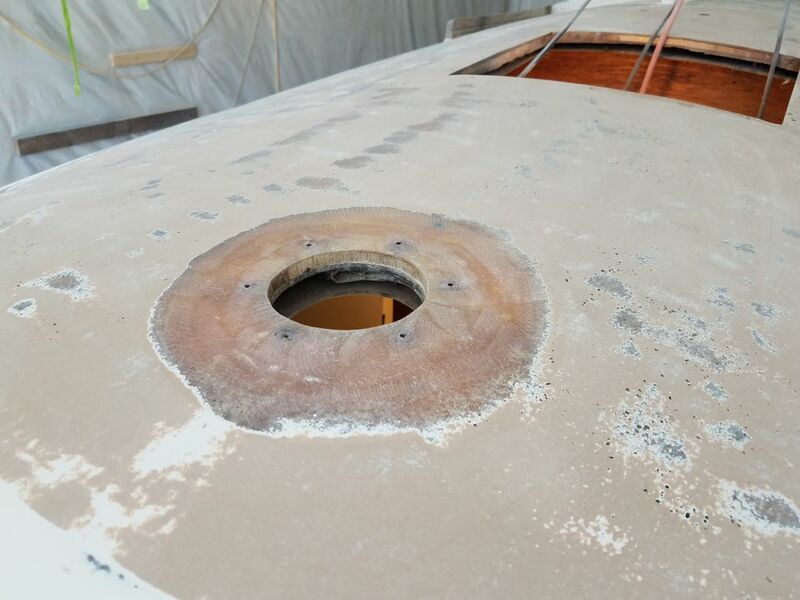 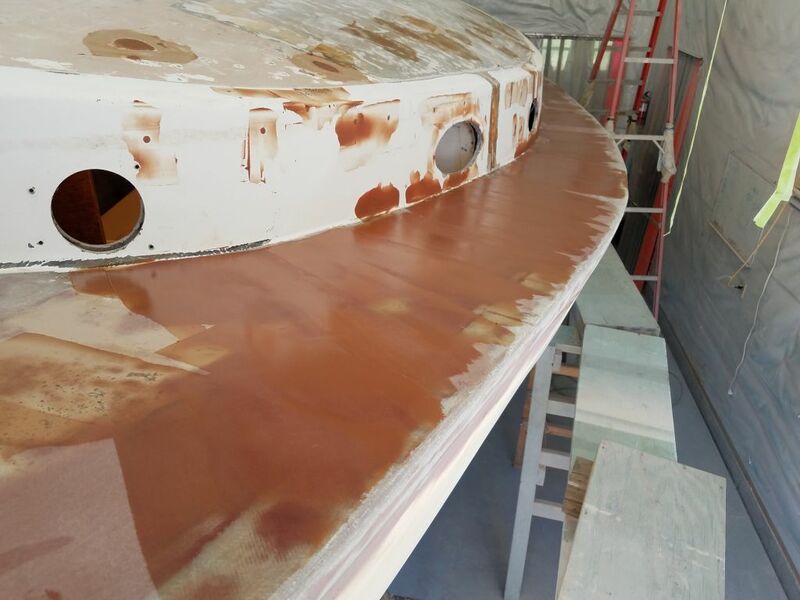 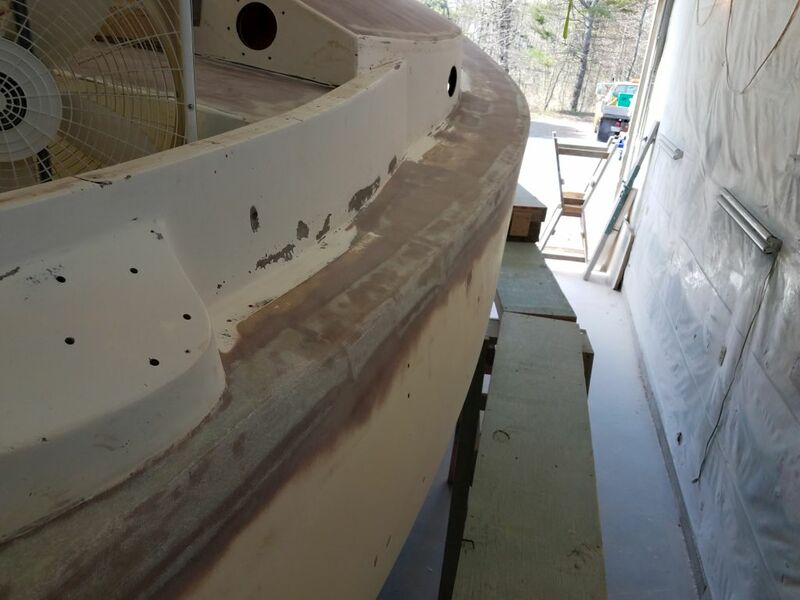 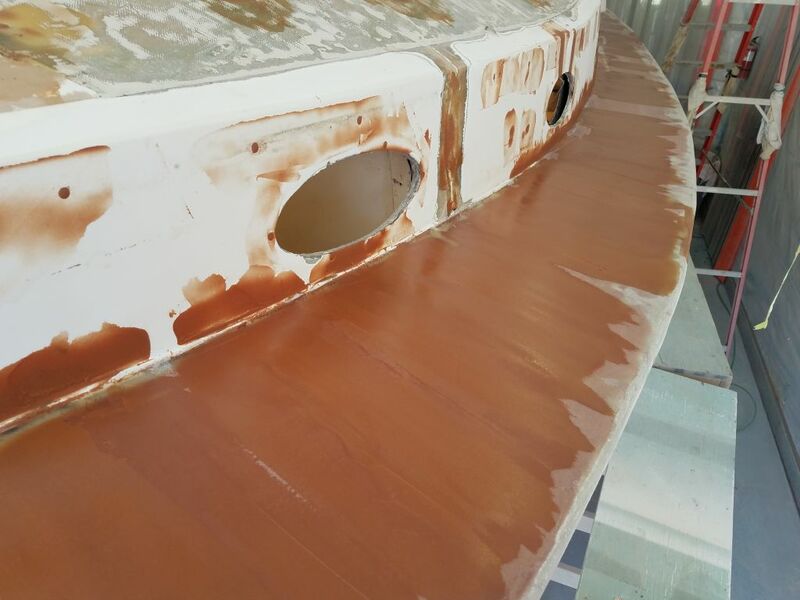 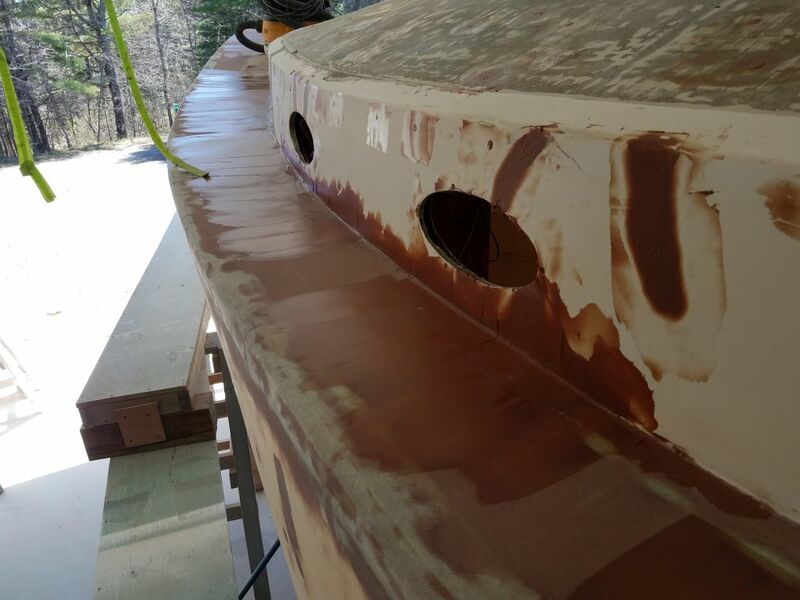 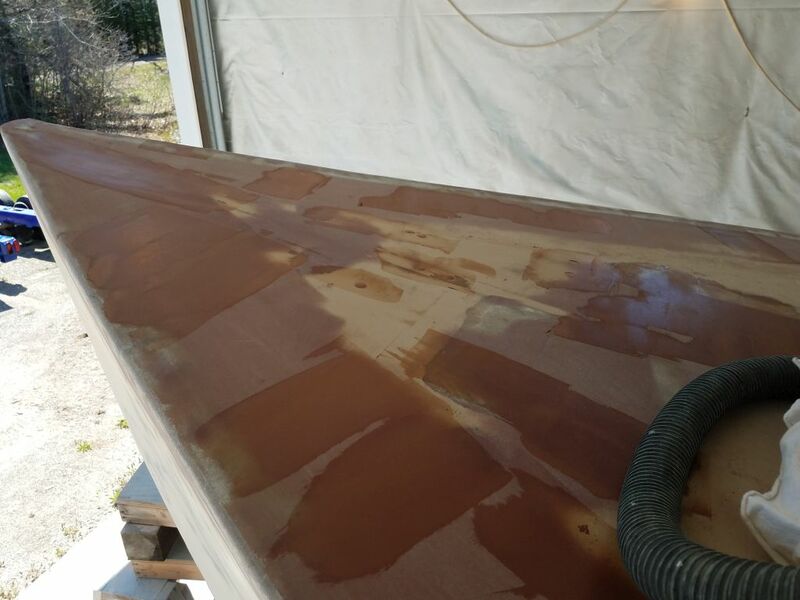 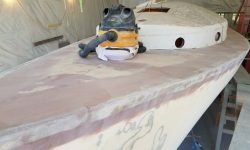 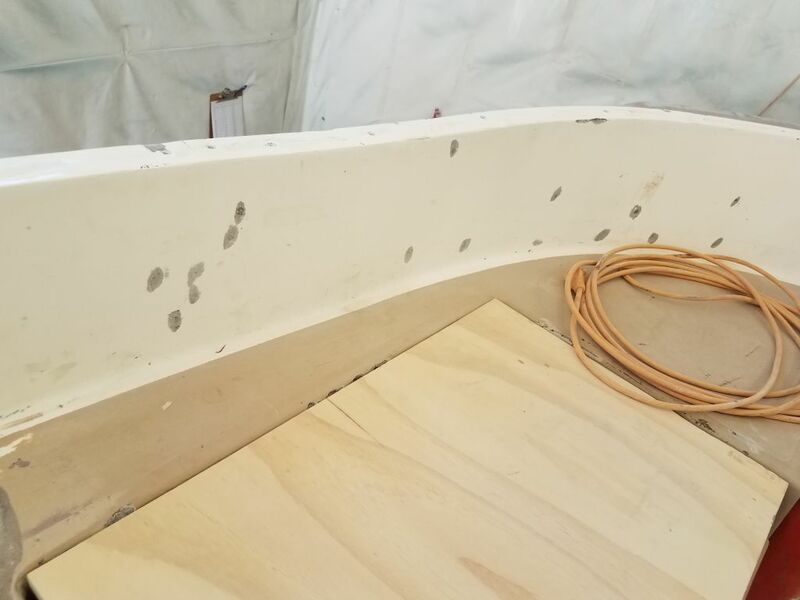 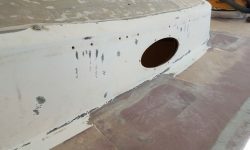 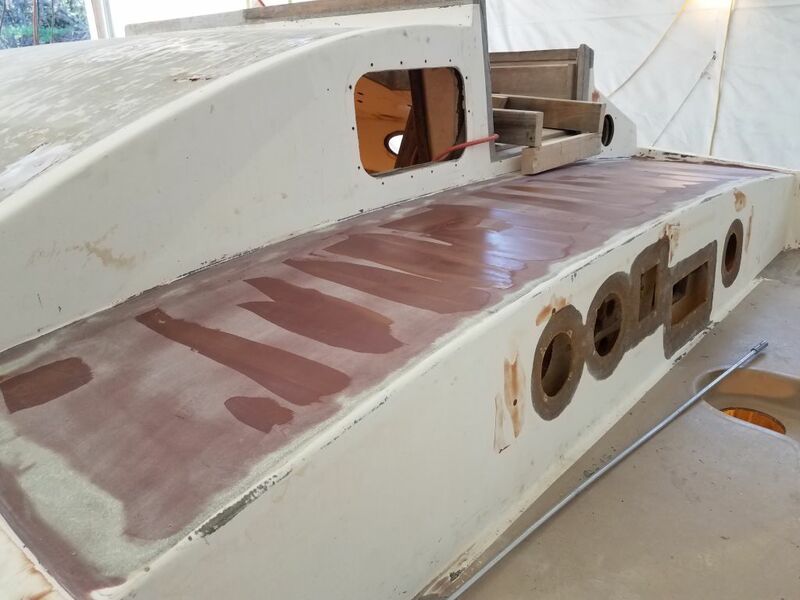 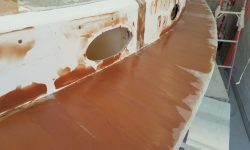 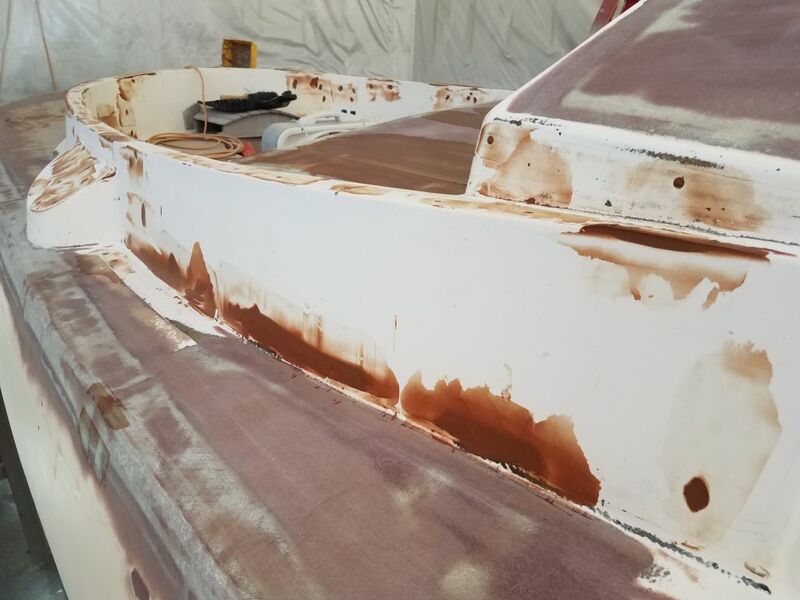 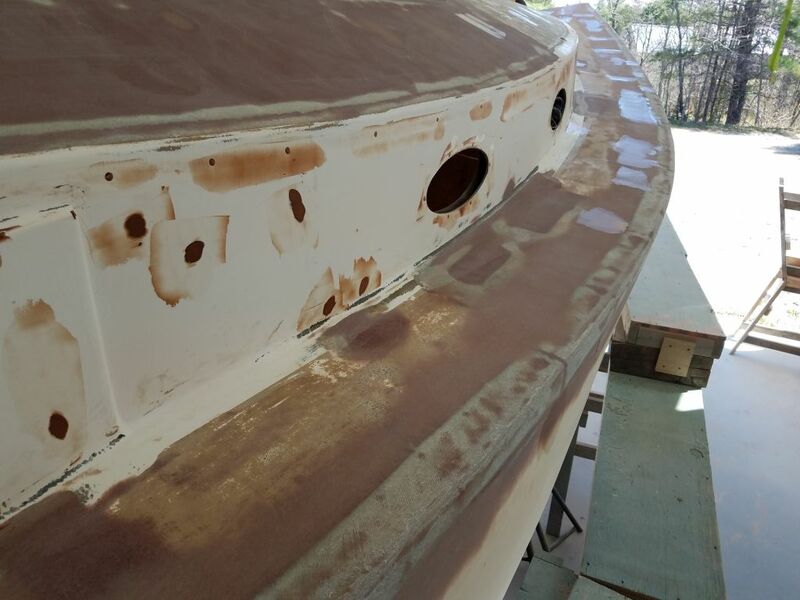 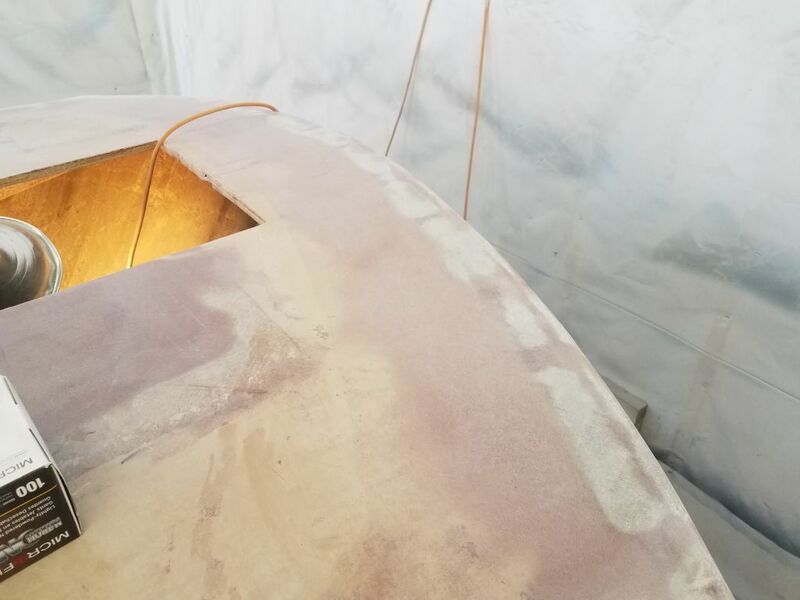 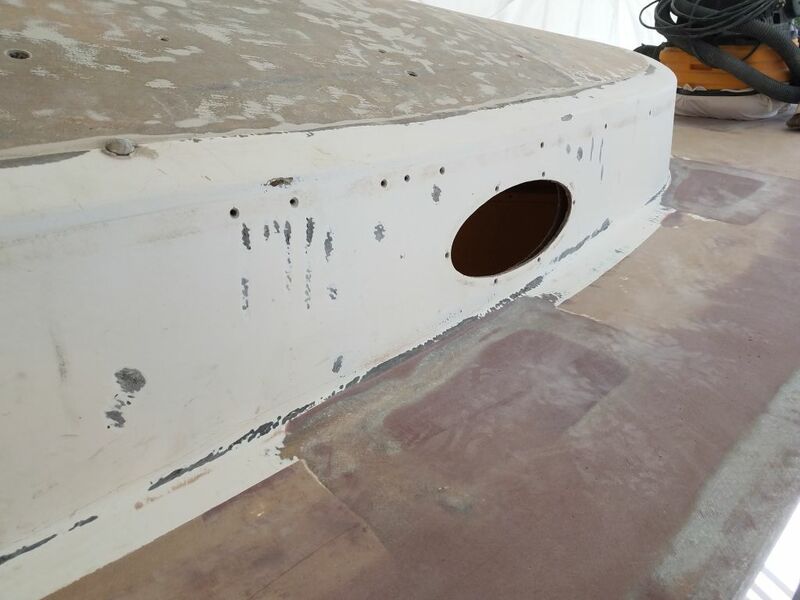 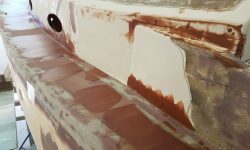 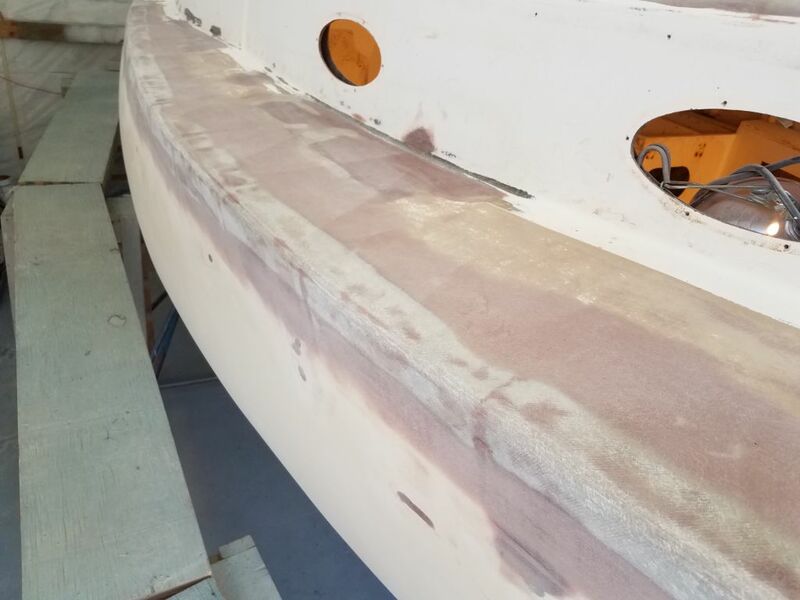 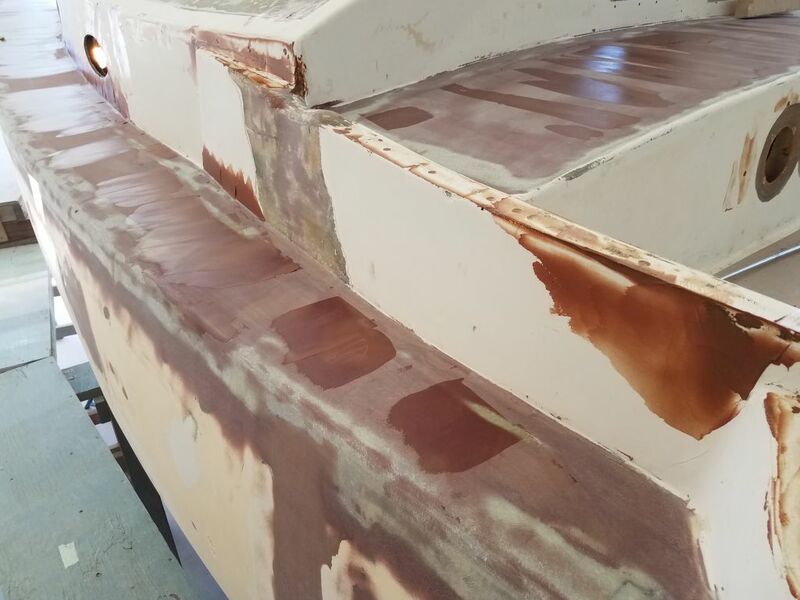 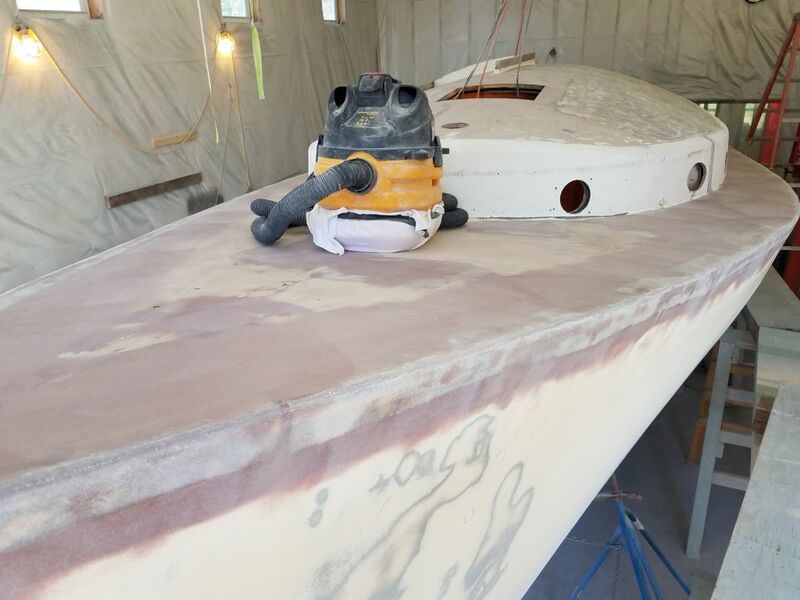 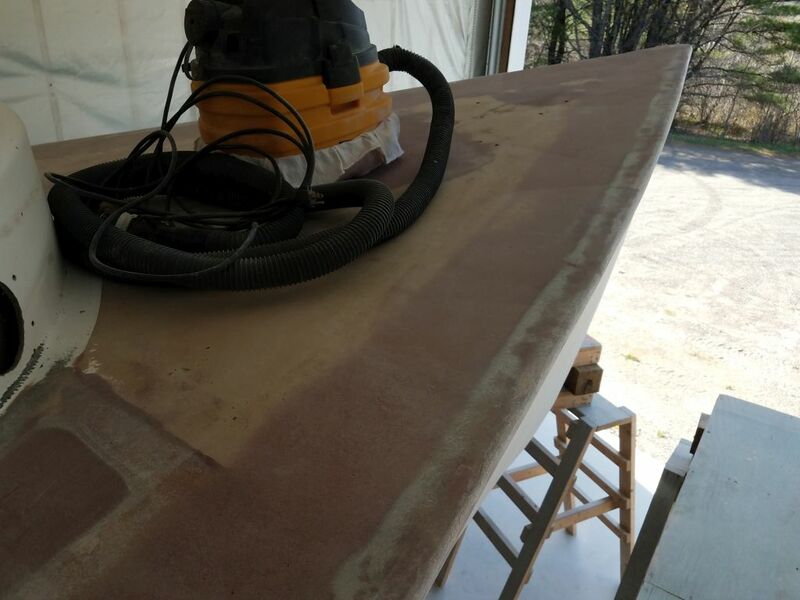 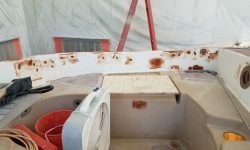 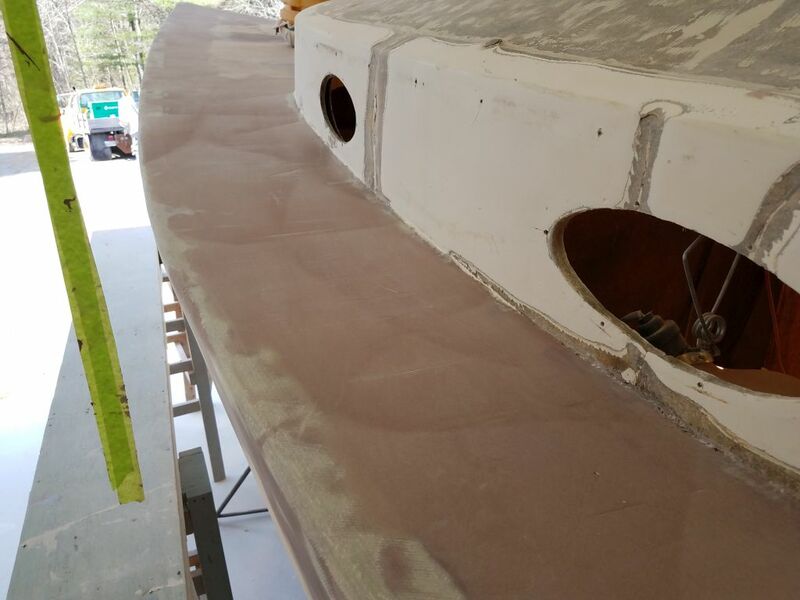 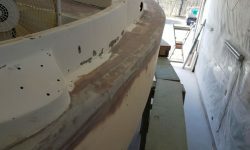 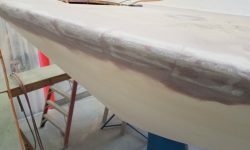 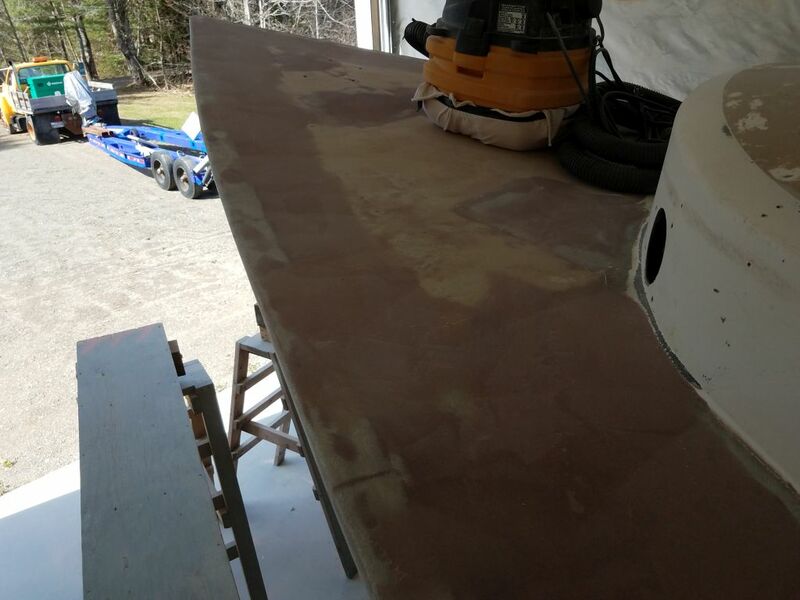 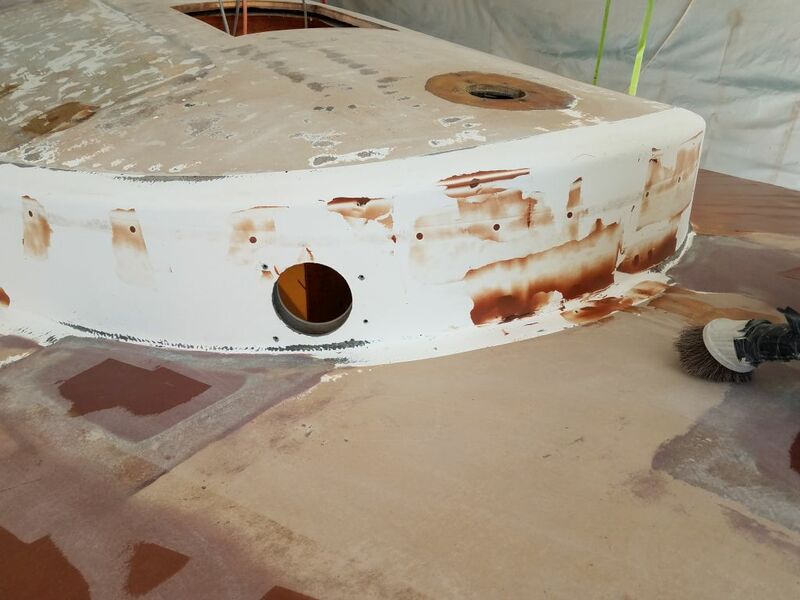 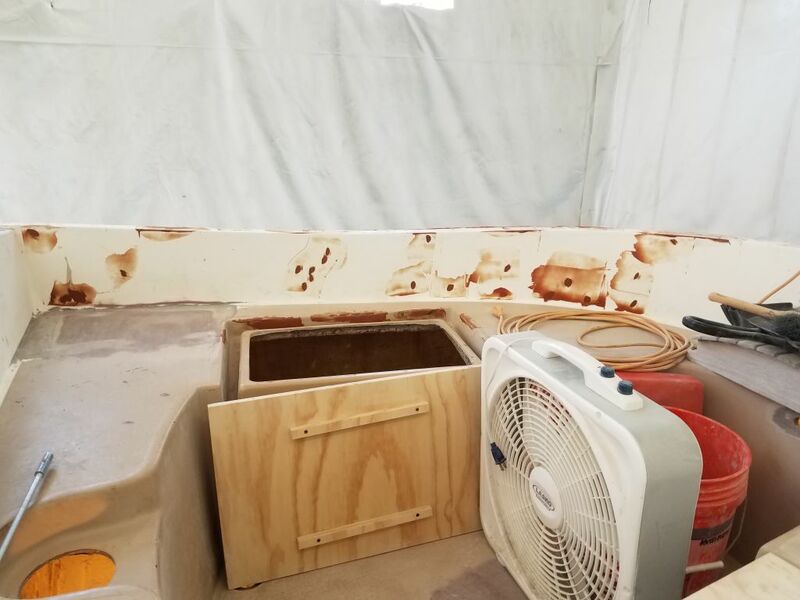 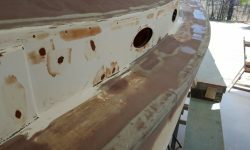 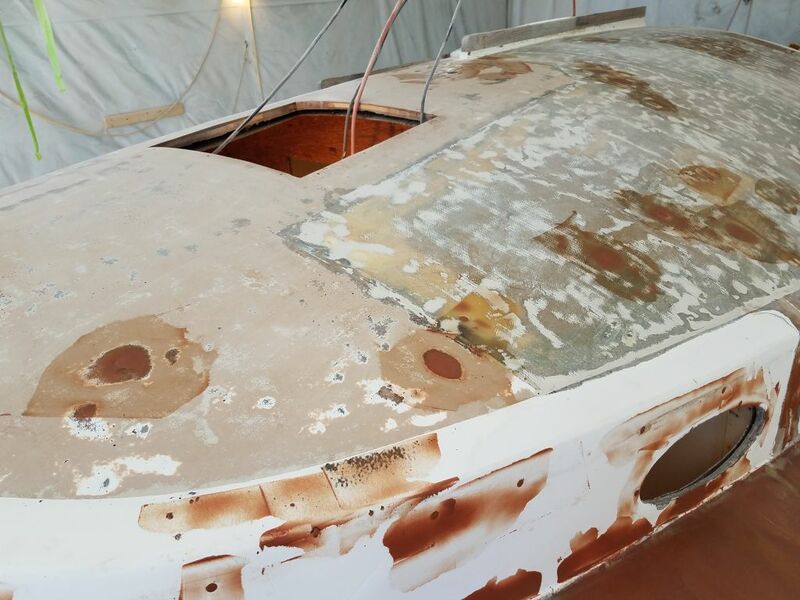 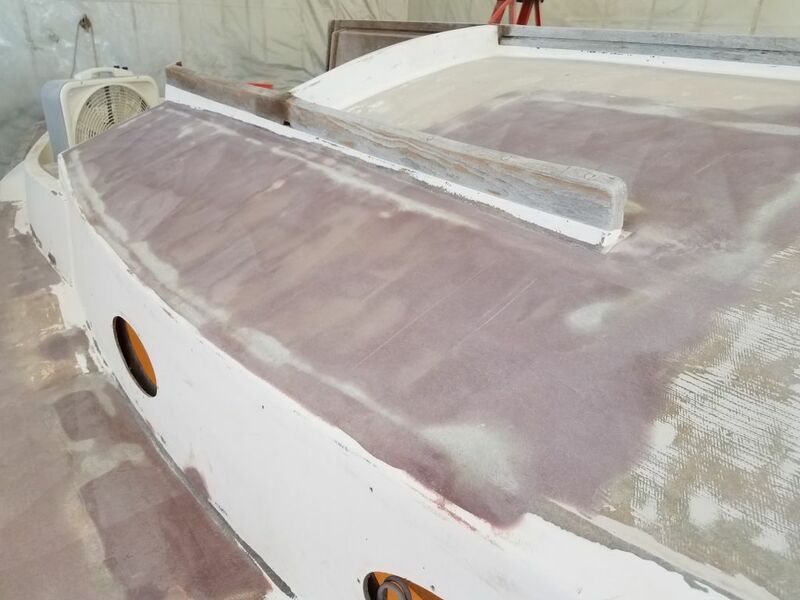 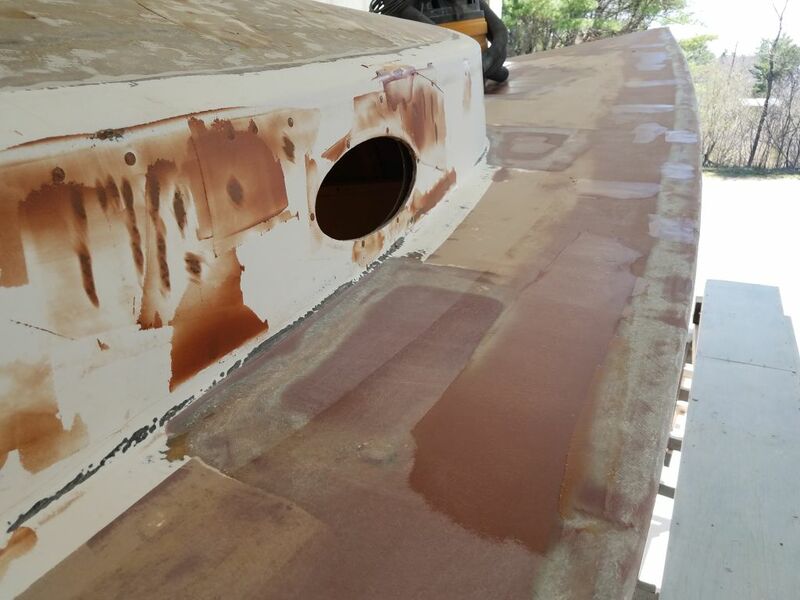 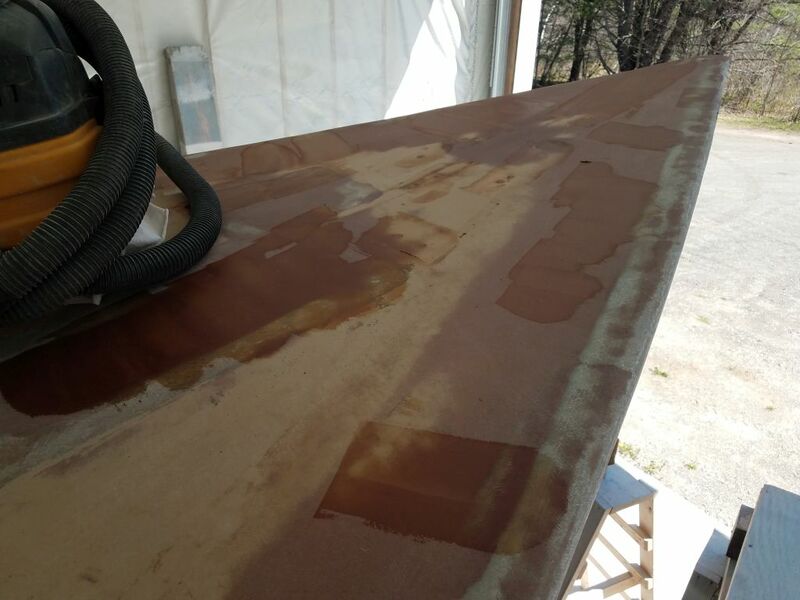 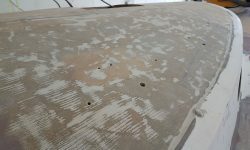 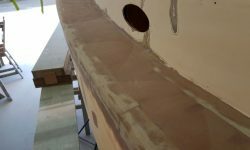 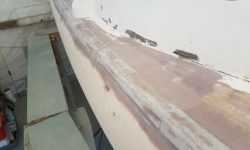 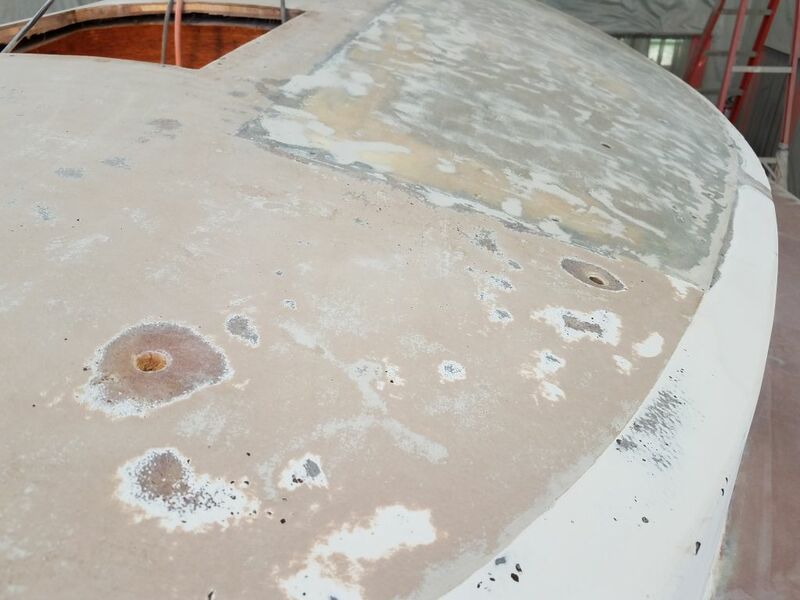 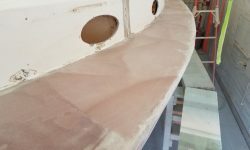 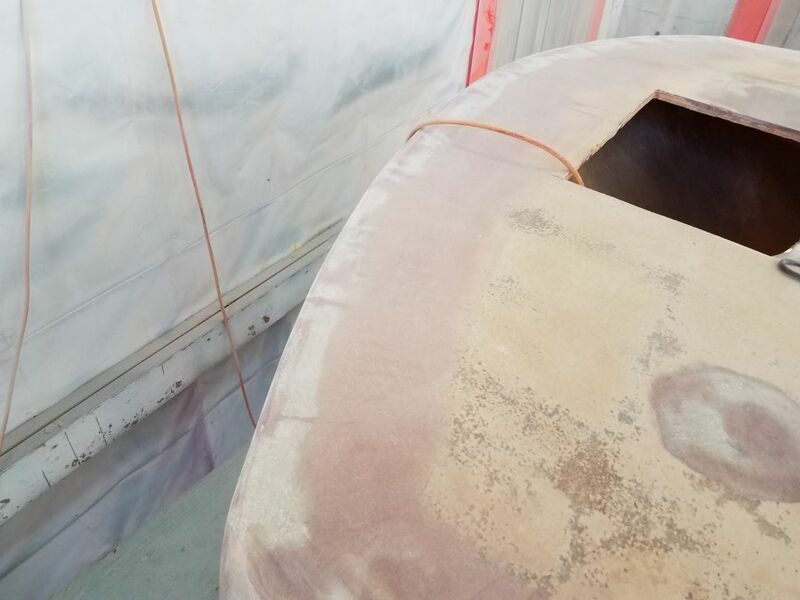 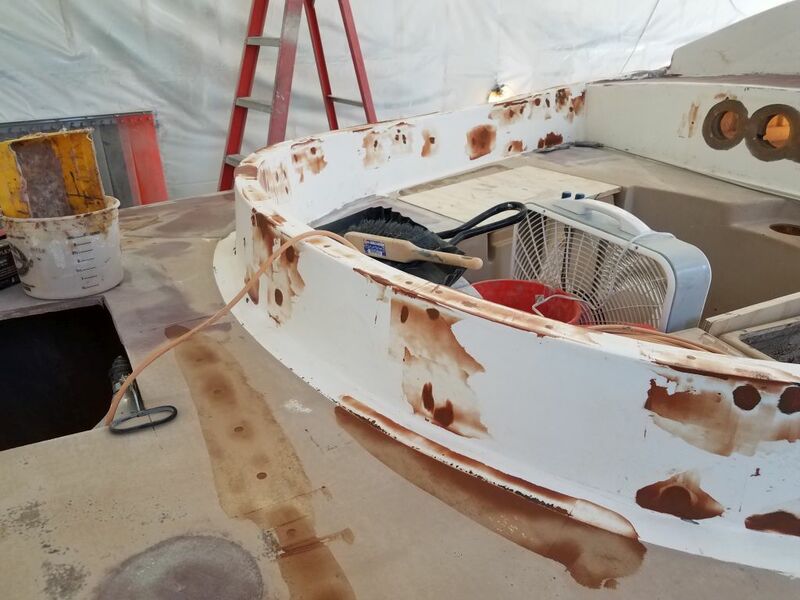 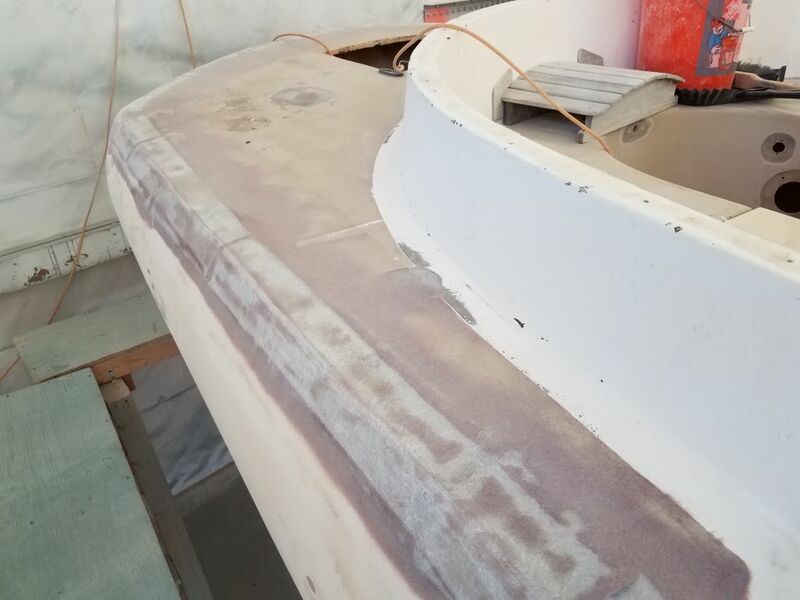 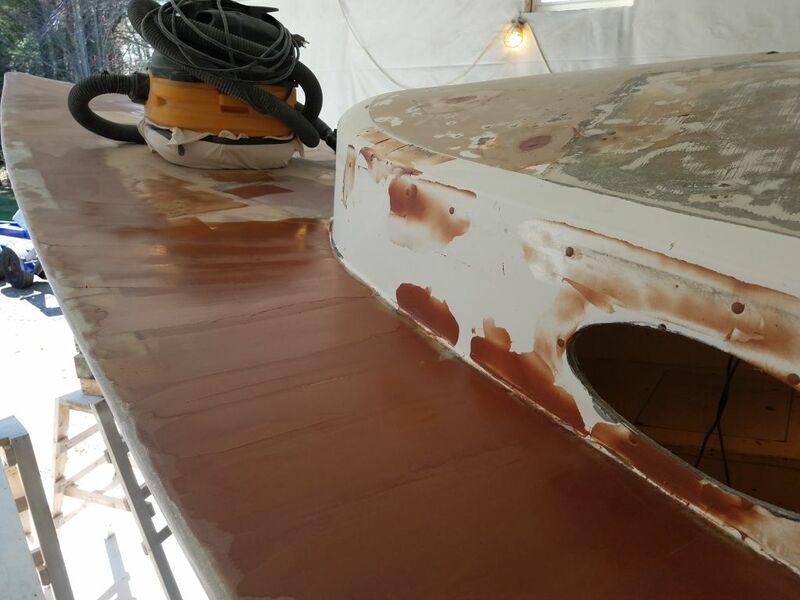 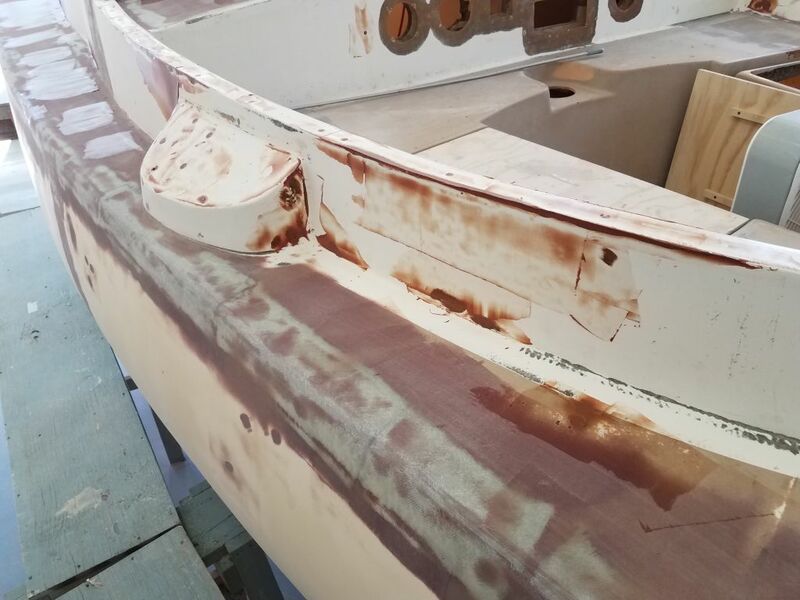 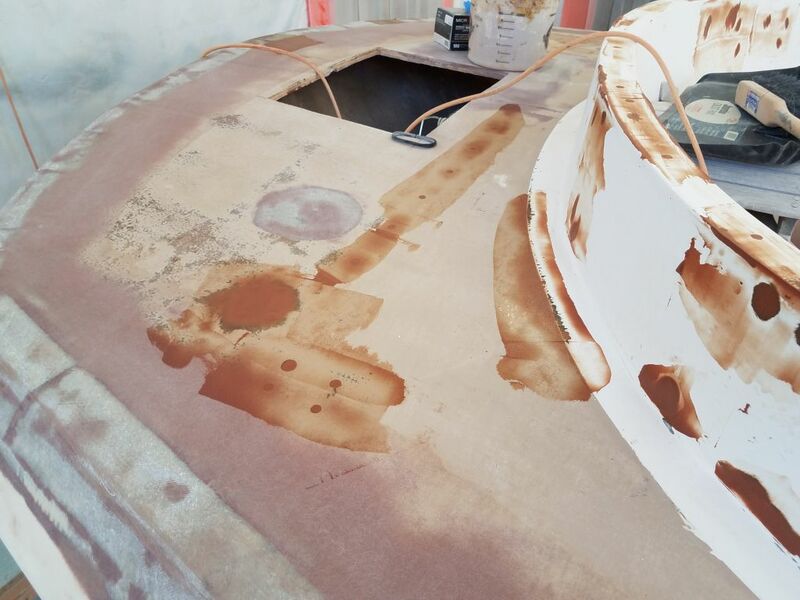 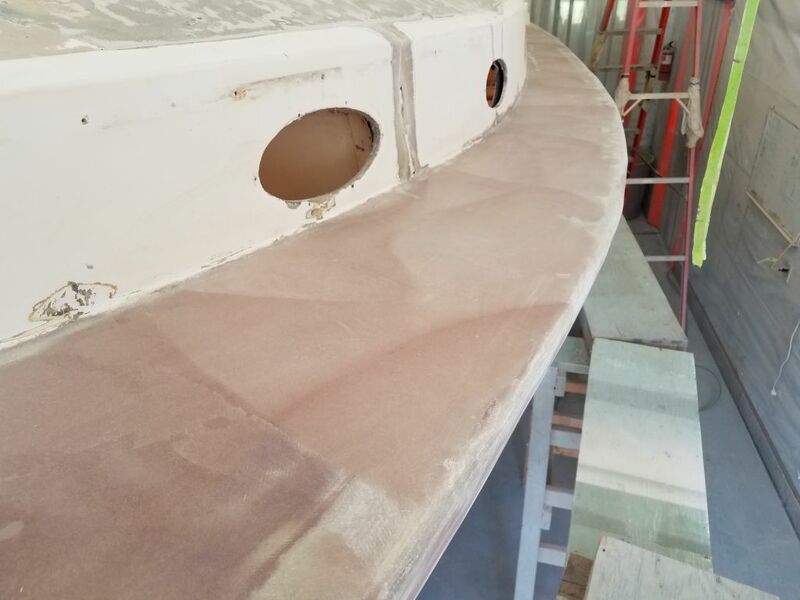 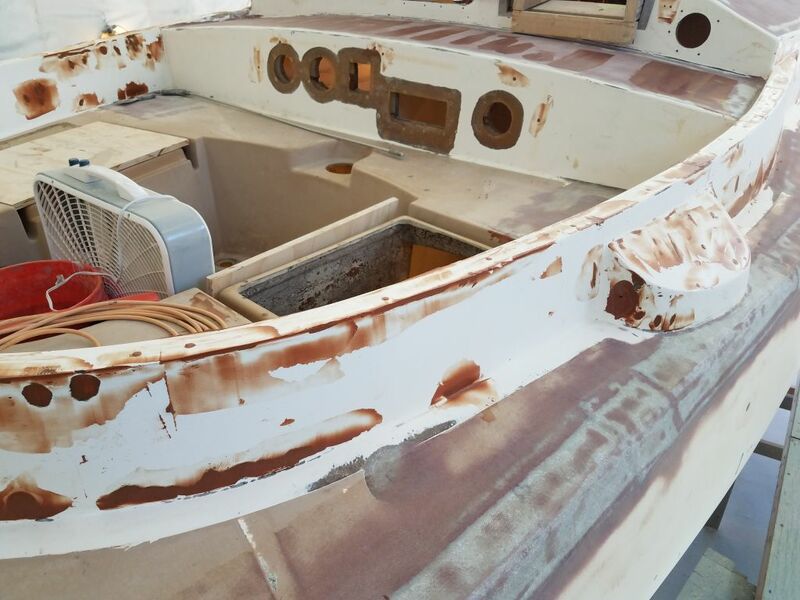 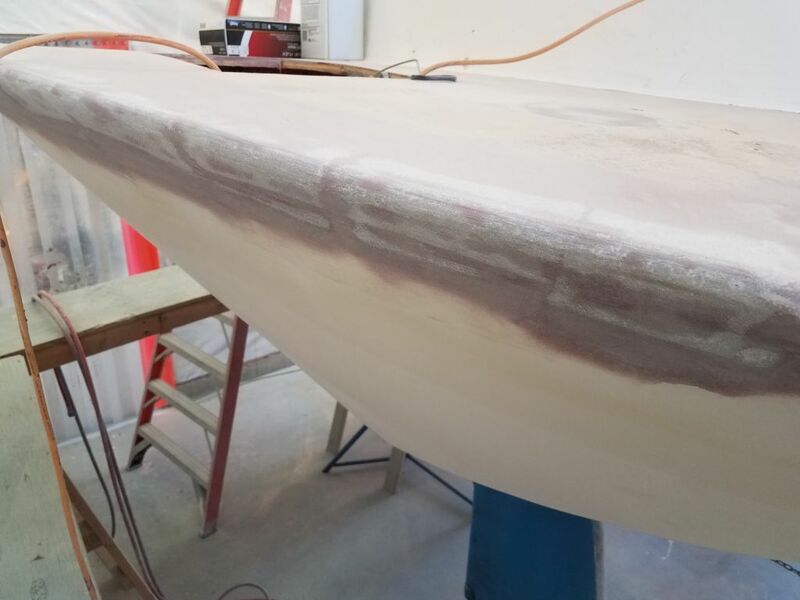 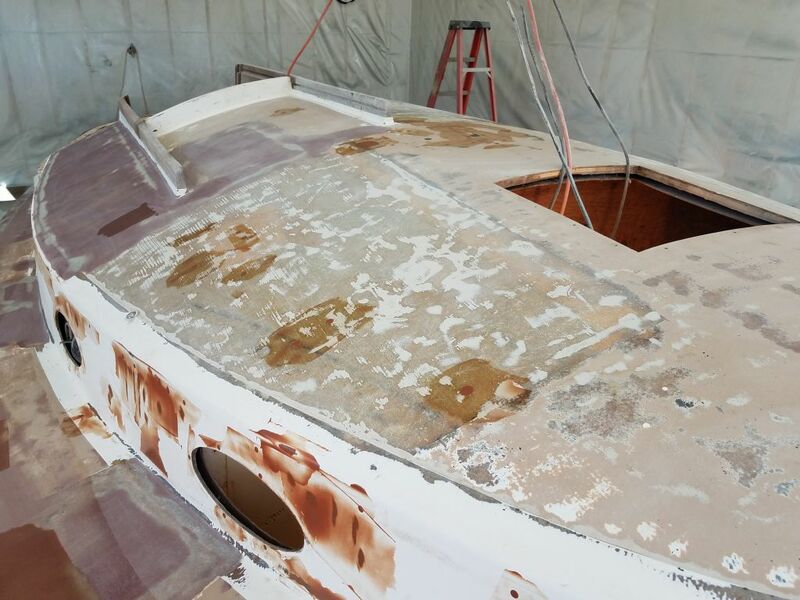 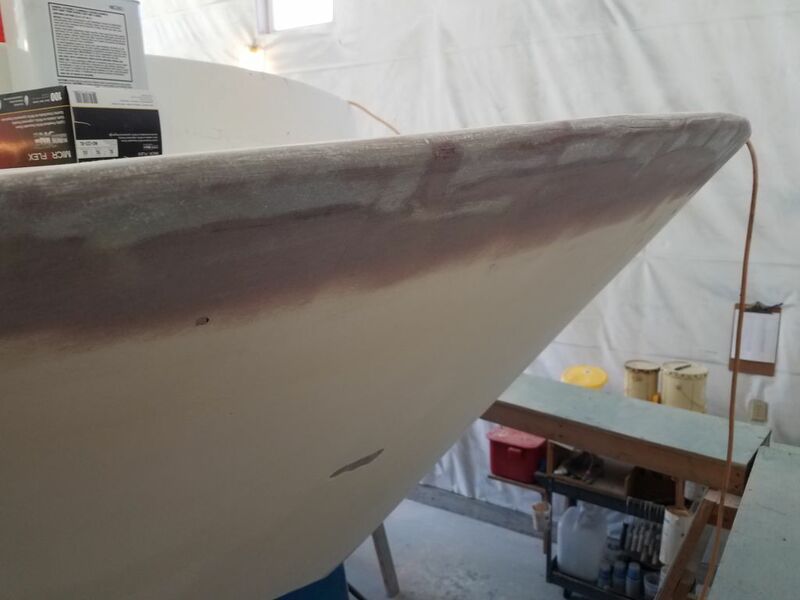 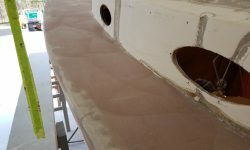 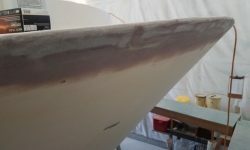 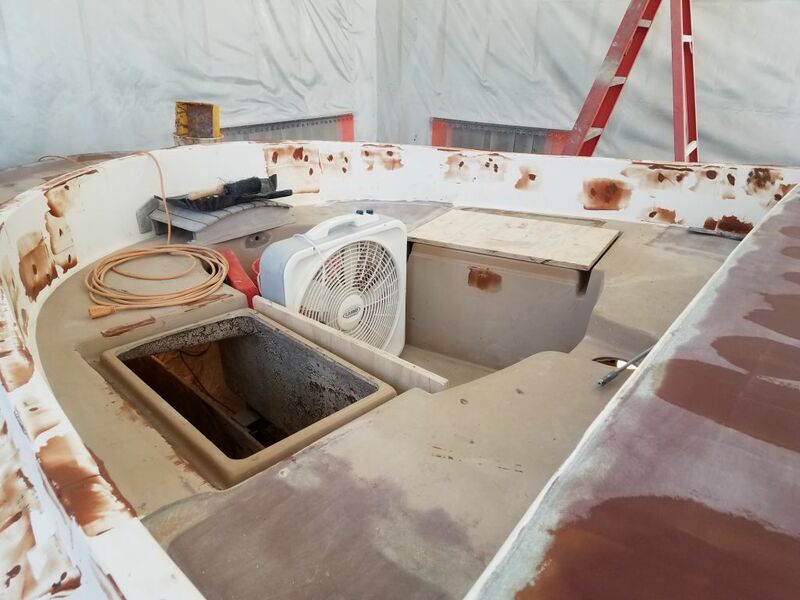 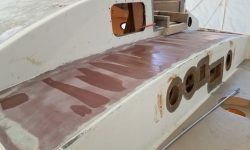 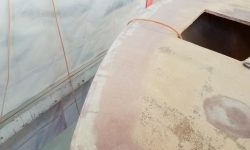 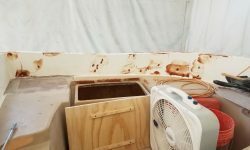 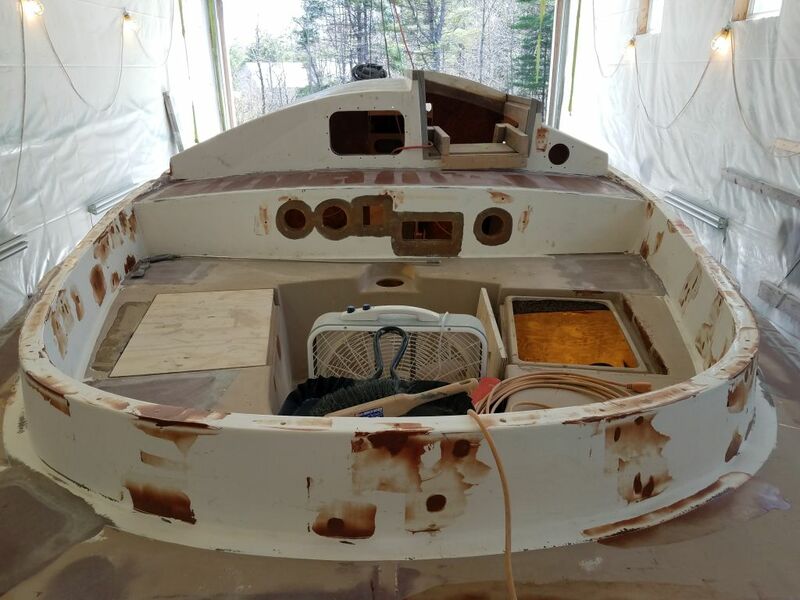 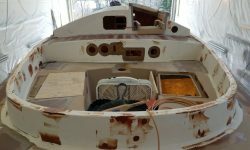 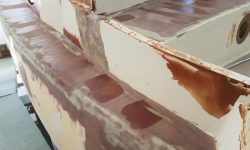 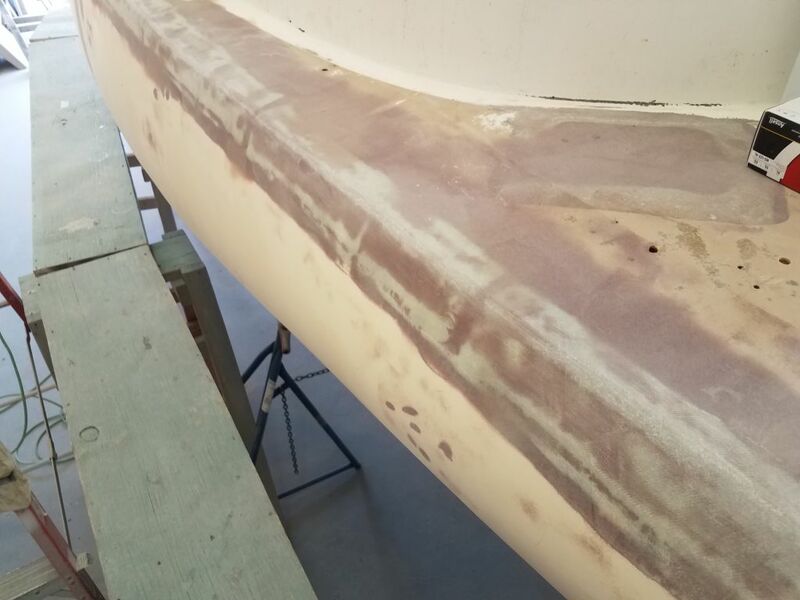 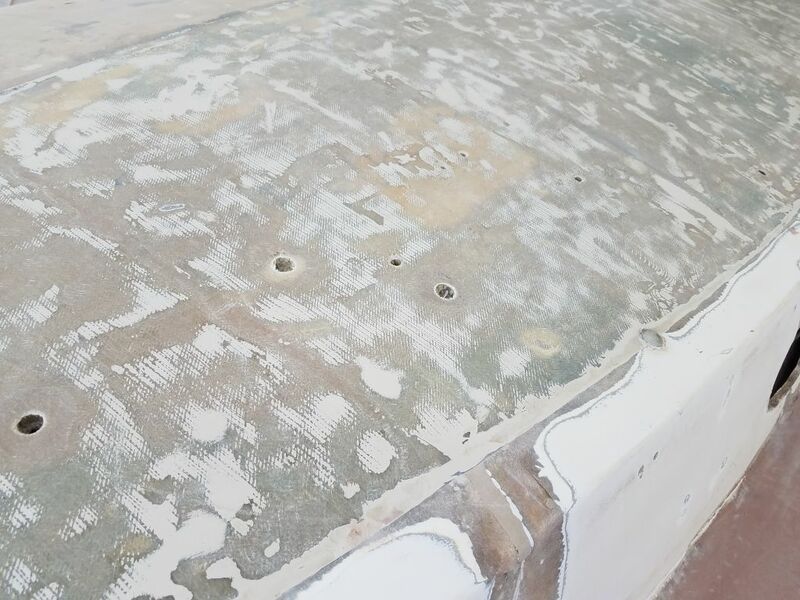 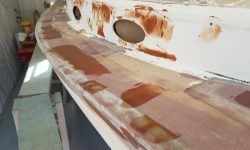 Another round of sanding brought both sides of the hull/deck close to where they needed to be, leaving only a few areas requiring additional spot filling. 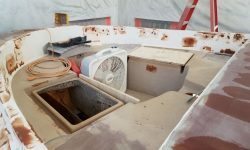 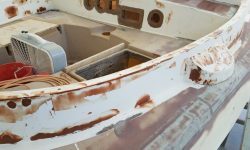 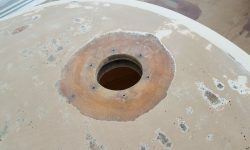 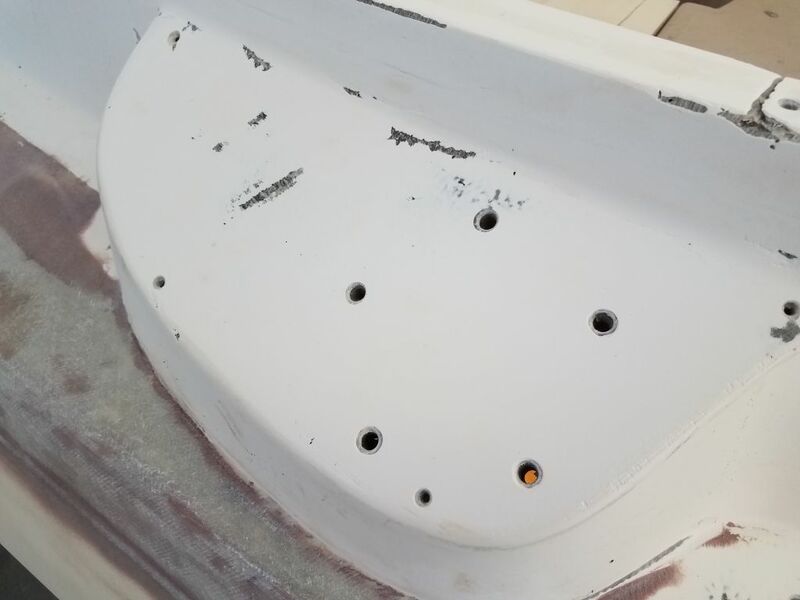 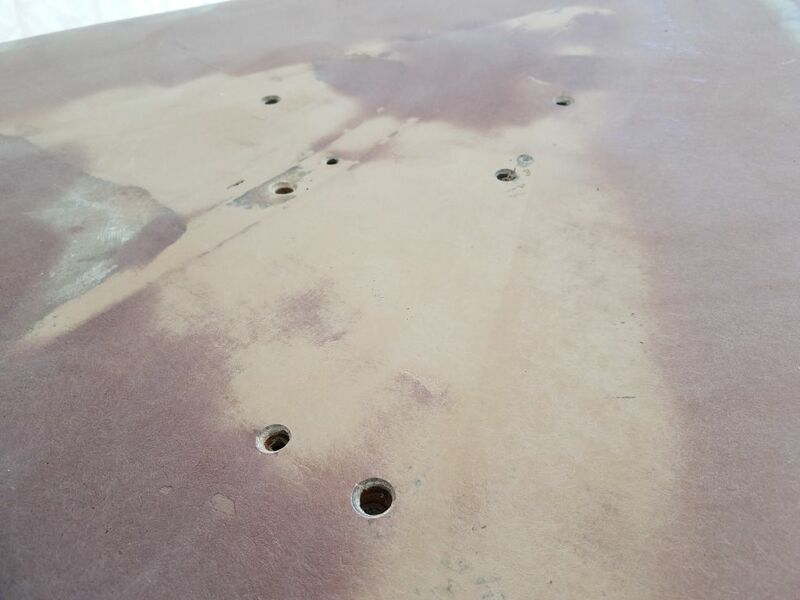 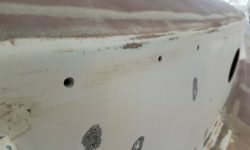 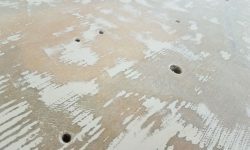 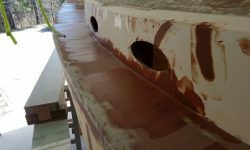 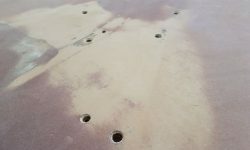 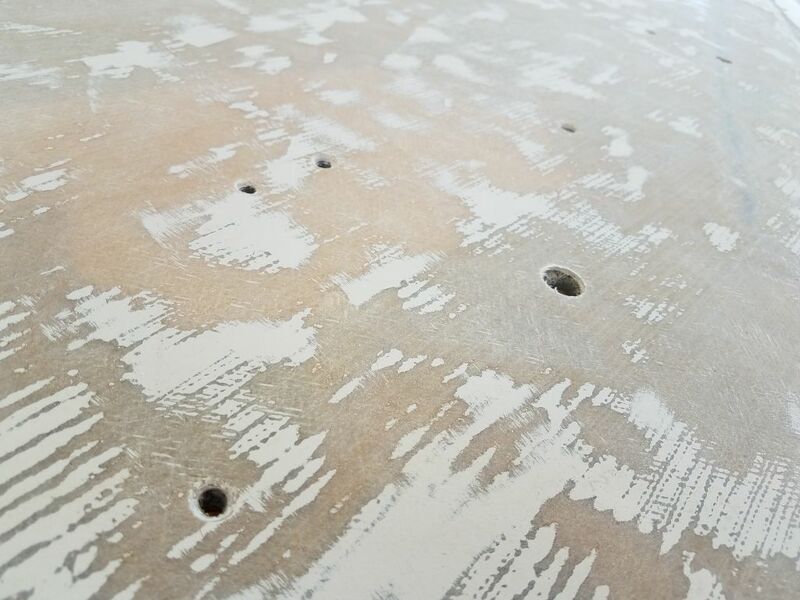 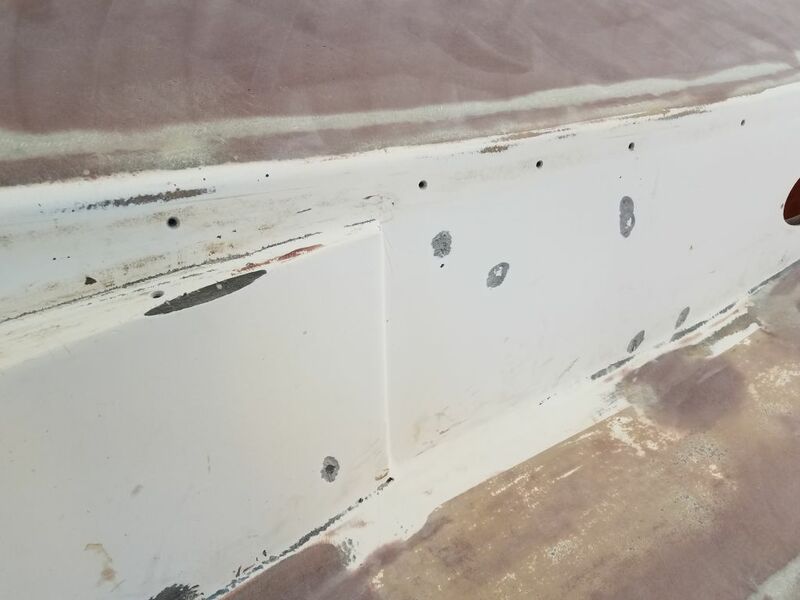 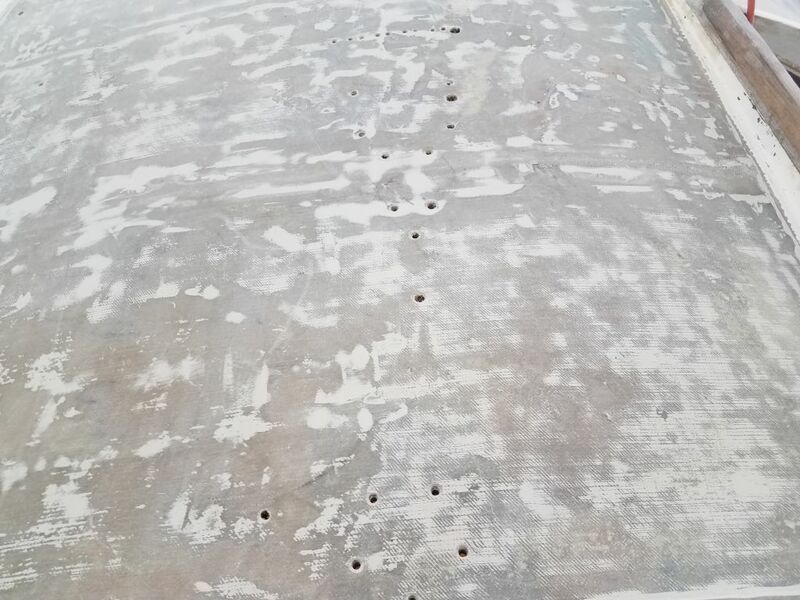 Before continuing work on the main rehabilitation of the coachroof, I wanted to prepare and fill the various fastener holes and test holes I’d drilled earlier in the project, as well as prepare a large hole left over from the solar vent for patching. 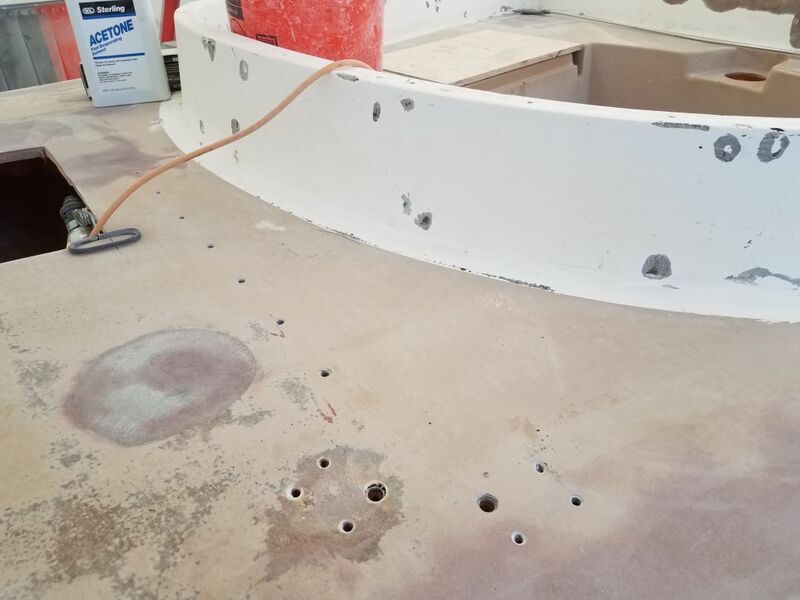 As needed, I used a countersink, small grinder, or (for the solar vent hole) large grinder to prepare these areas for filling later in the day. 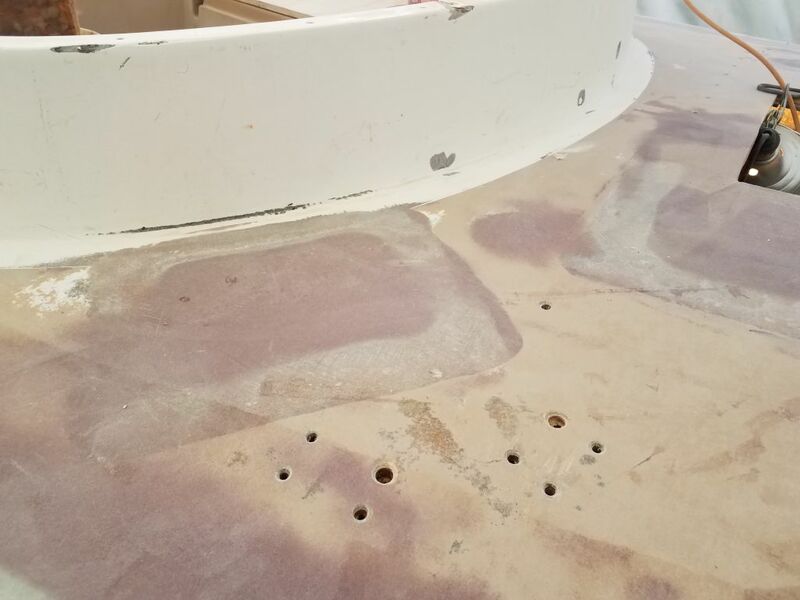 At the same time, I went around the rest of the decks and cockpit to prepare some additional old fastener holes for patching, and also to grind out with a small sanding disc a large number of small dings, cracks, voids, and other issues in the cabin trunk, cockpit coamings, and elsewhere as needed. 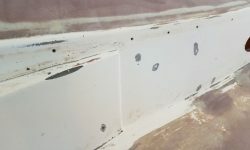 At the cockpit locker openings, I prepared the port side for some fiberglass patching, grinding a section that had been previously repaired and damaged by the action of the locker lid hinges, and drilled out the fastener holes on the starboard side so I could fill them and allow flexibility in configuring the hinges sometime much later in the project. 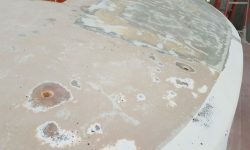 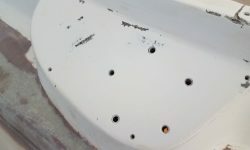 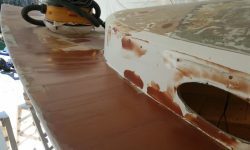 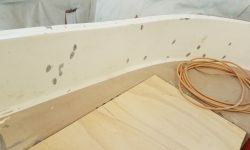 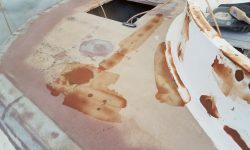 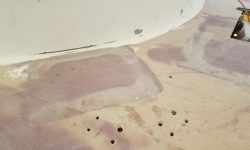 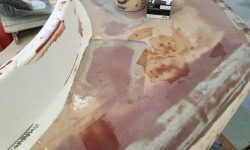 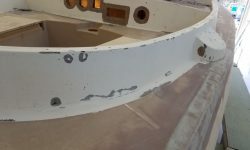 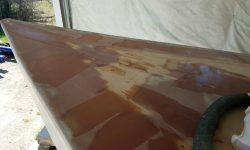 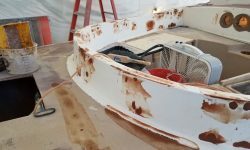 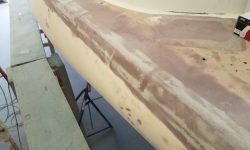 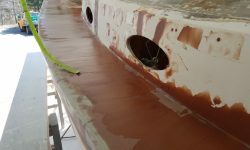 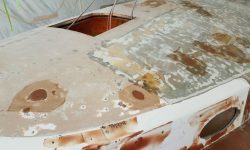 After a thorough cleanup, I went around with epoxy fairing compound and a trowel and spot-filled all the areas I’d just prepared, including fastener holes and spot-ground repairs, and also applied additional fairing compound to portions of the bridgedeck, hull/deck joint, and port sidedeck that required some fine-tuning. 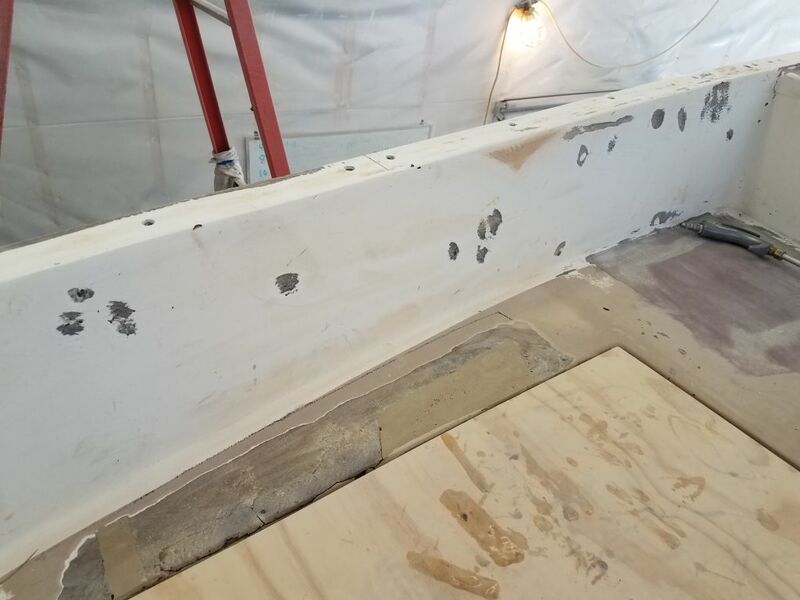 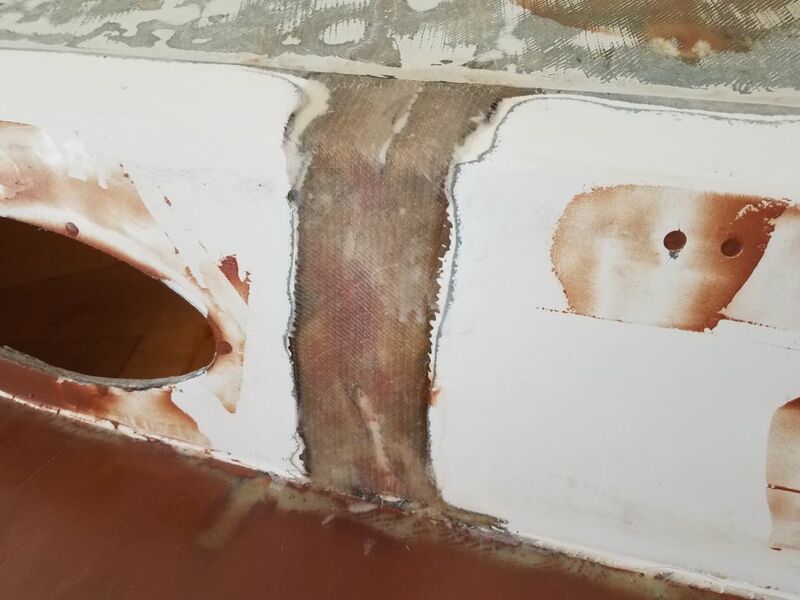 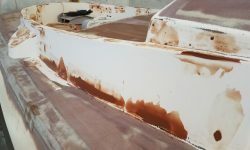 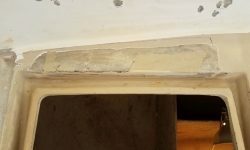 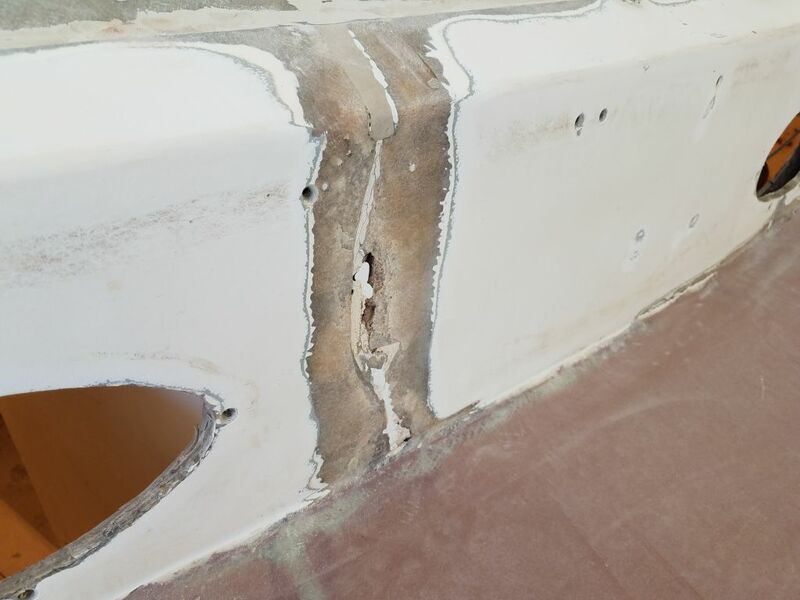 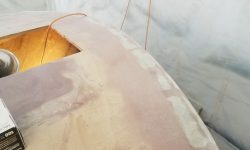 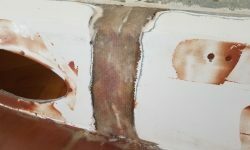 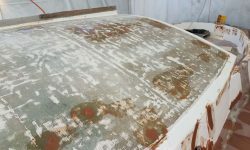 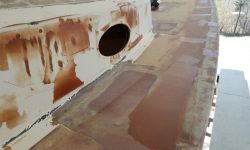 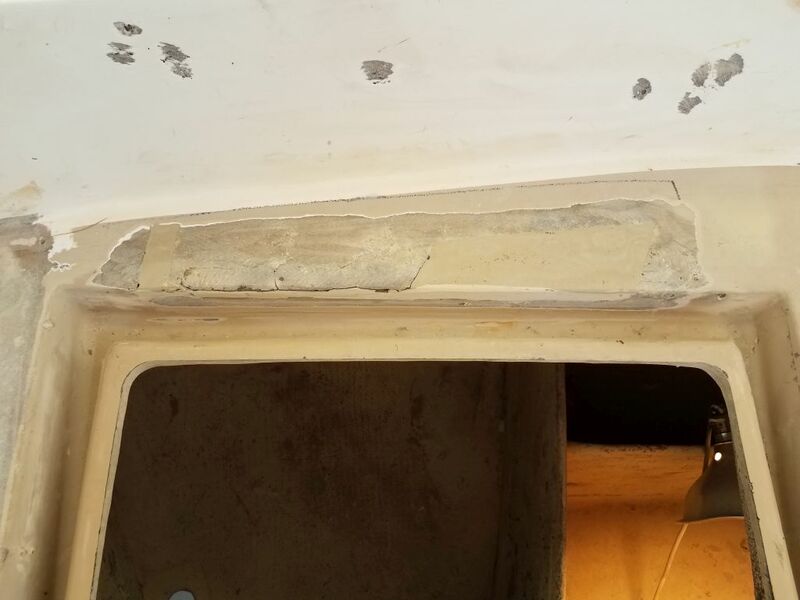 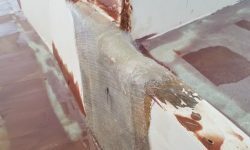 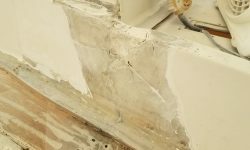 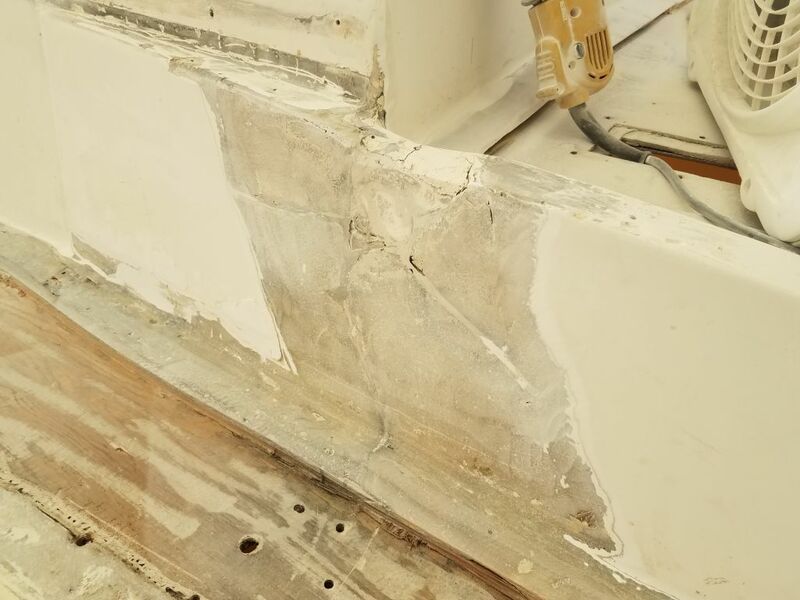 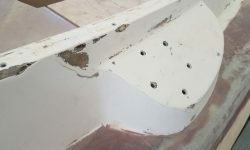 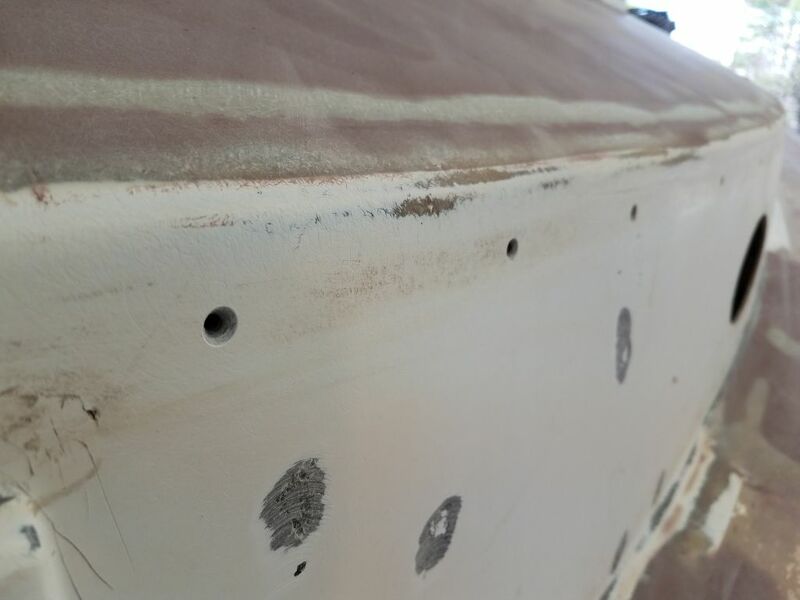 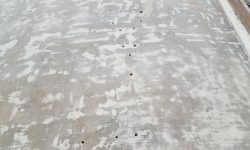 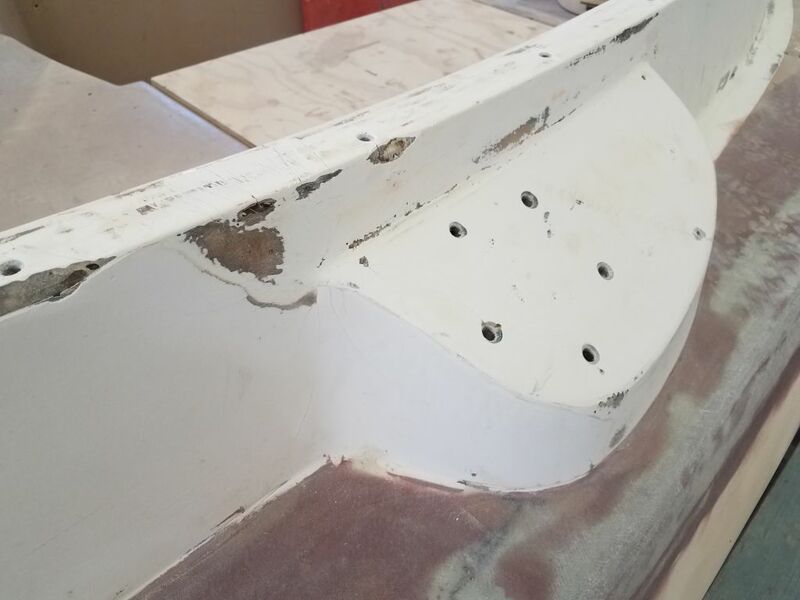 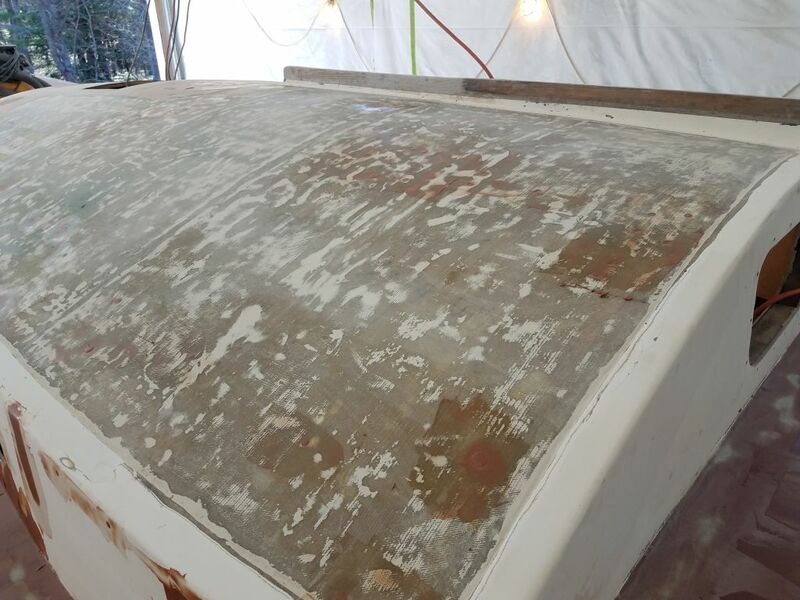 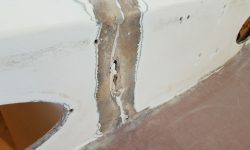 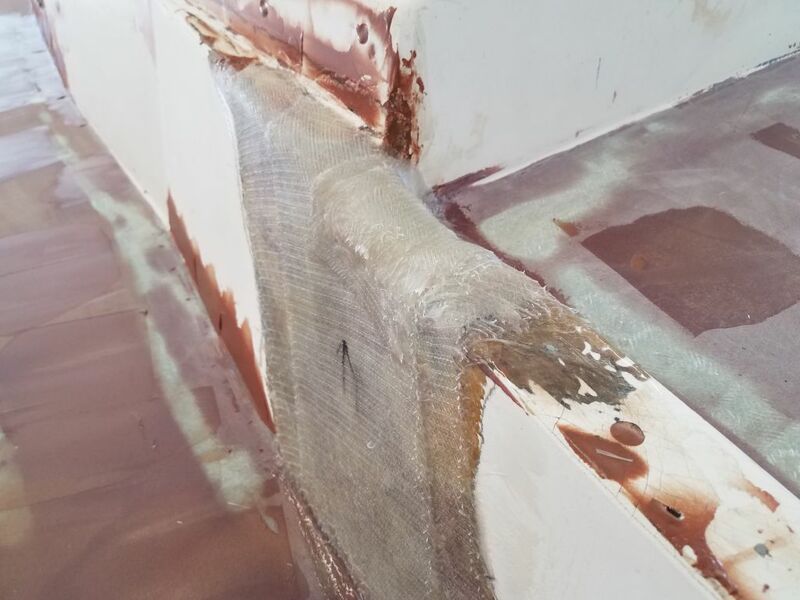 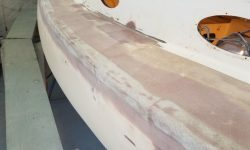 On the port forward side of the cabin trunk, there was an older crack that had been previously filled by some other person, but early in the process I’d ground out the old filler since the crack needed additional reinforcement. 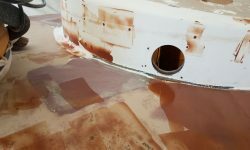 Similarly, in that timeframe I’d also ground out a nasty section of the port cockpit coaming. 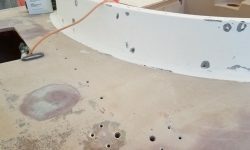 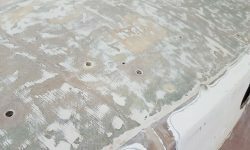 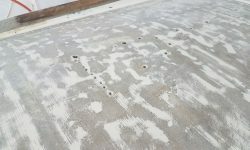 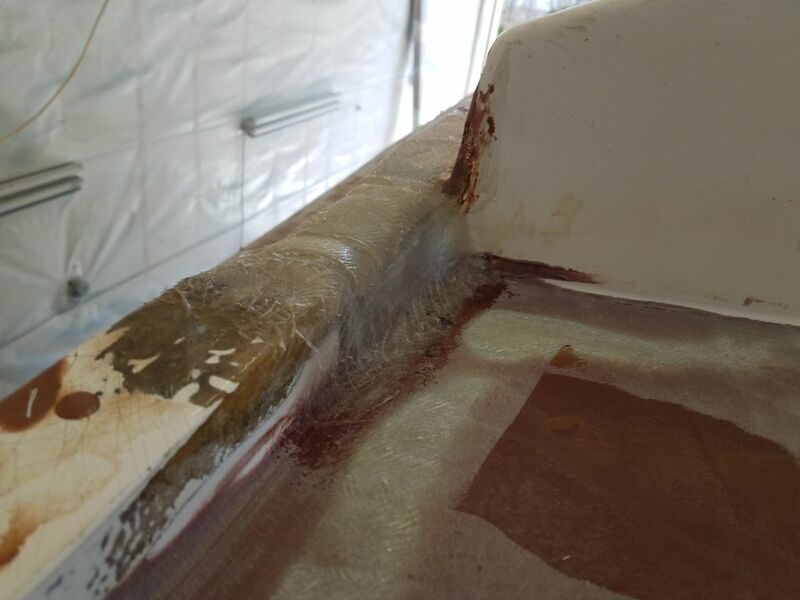 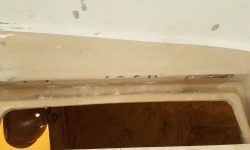 These areas have been showing up in other photos of the progress for weeks, but my focus was on the major repairs and these small details had to wait. 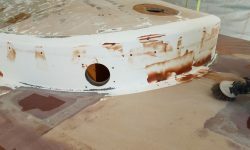 A few other repairs of similar magnitude, including patching the myriad instrument holes beneath the bridgedeck, loomed ahead in the immediate future as well. 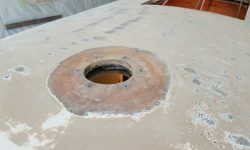 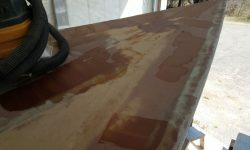 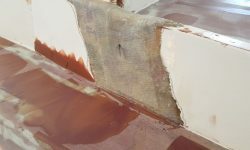 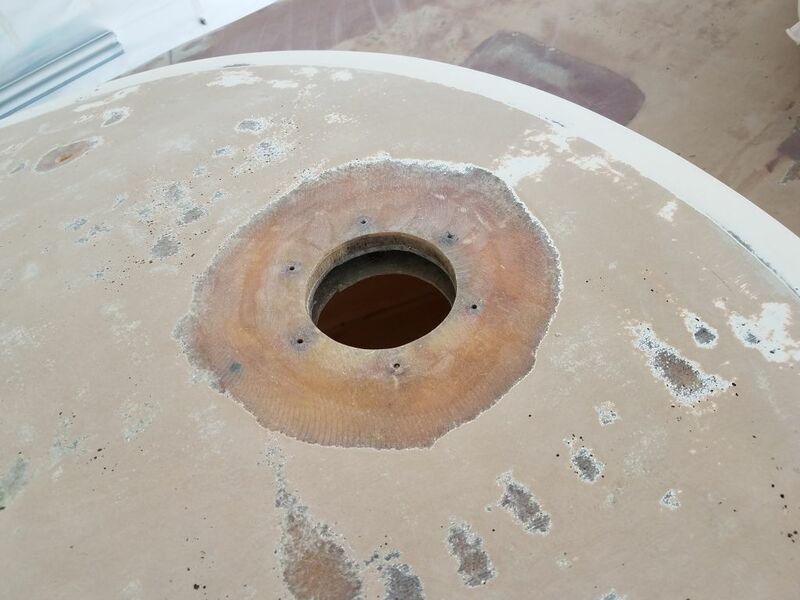 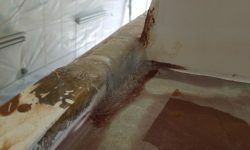 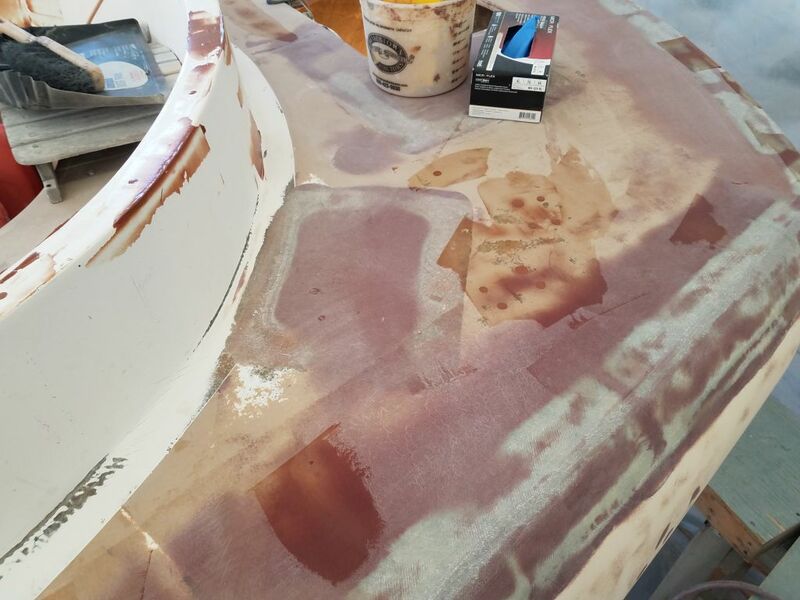 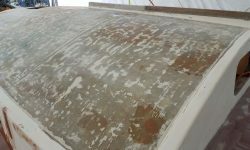 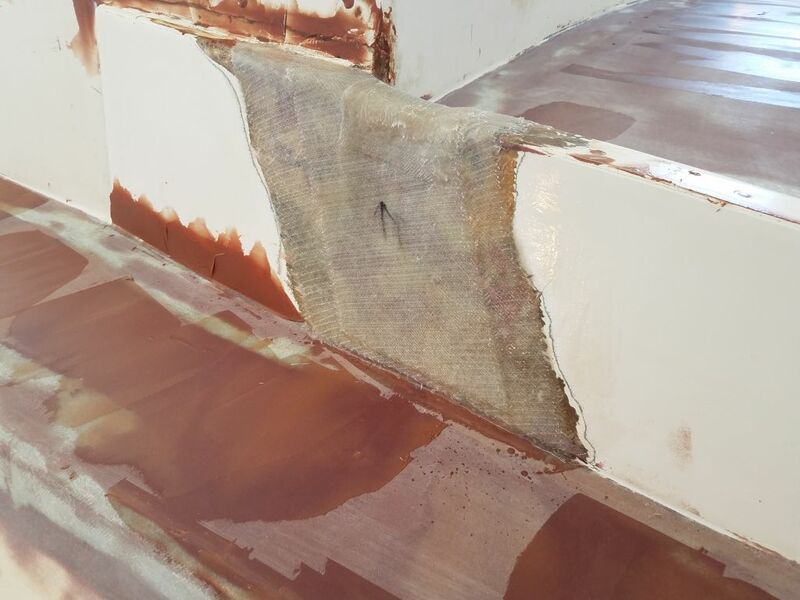 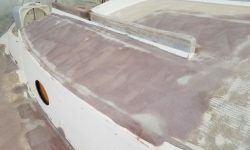 Now, I prepared some biaxial fiberglass to fit the two patch areas and installed it in epoxy resin. 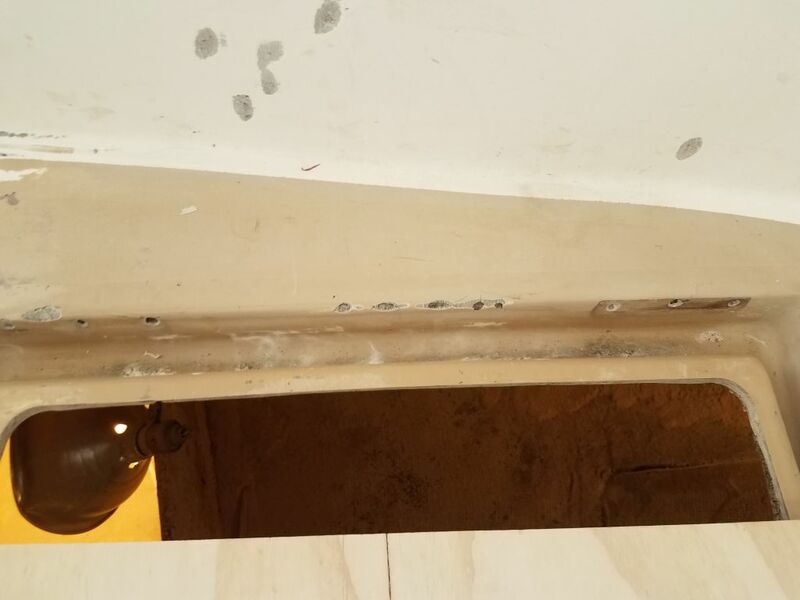 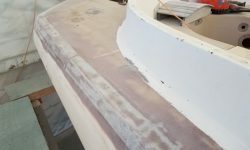 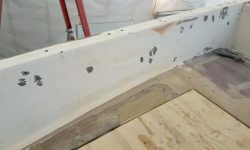 For the forward crack, one layer was sufficient to bridge the existing crack and help reinforce it, but at the coaming the damage required more of a buildup, mainly at the top edge where I’d had to grind back quite a bit of crushed and crumbled material. 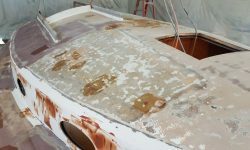 I added in enough new fiberglass to at least approximate the original height for now.